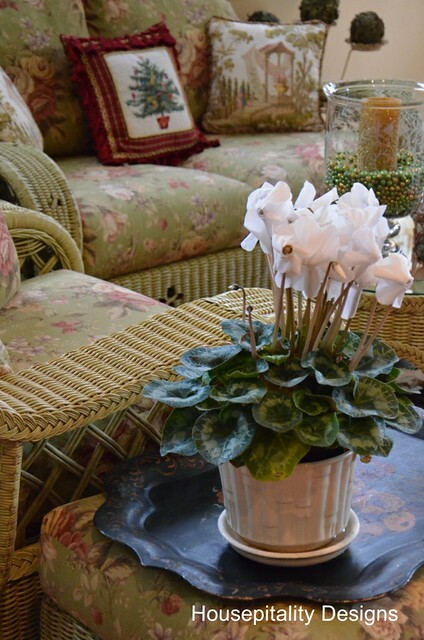 while hubby was playing in a Baseball tournament. 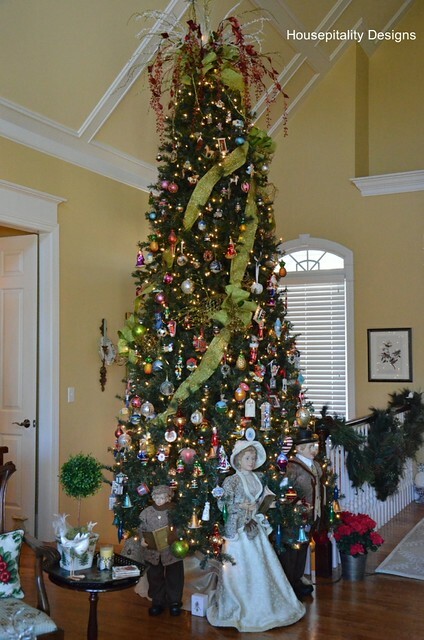 as they could be stacked inside of each other . 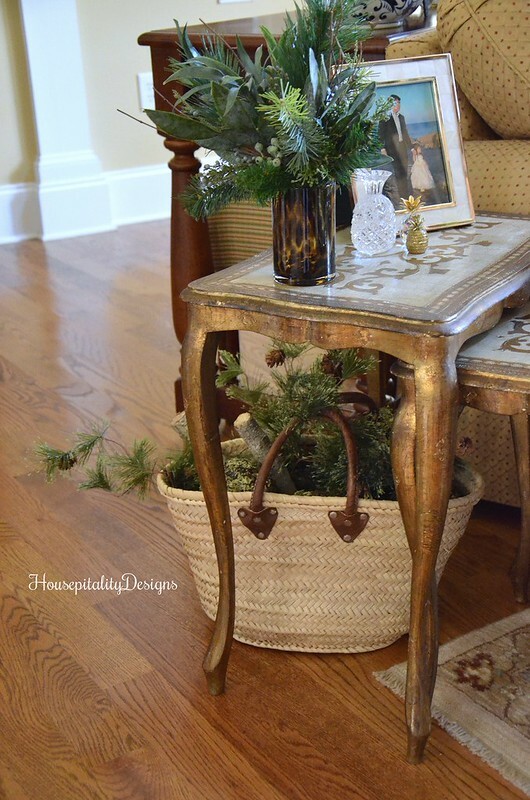 . . Florentine Nesting tables. 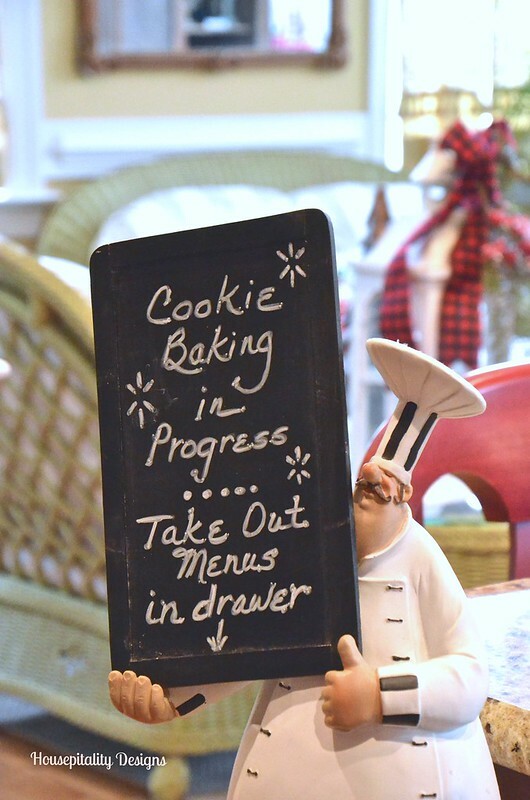 is what the kitchen chalkboard chef sign says these days. 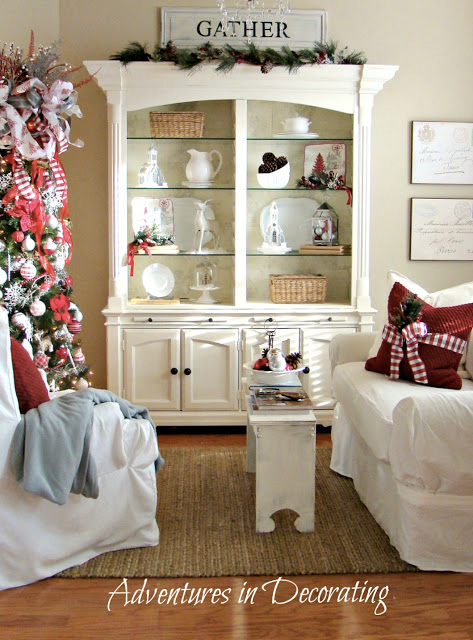 or the island is filled with rolls of wrapping paper, boxes and ribbon? 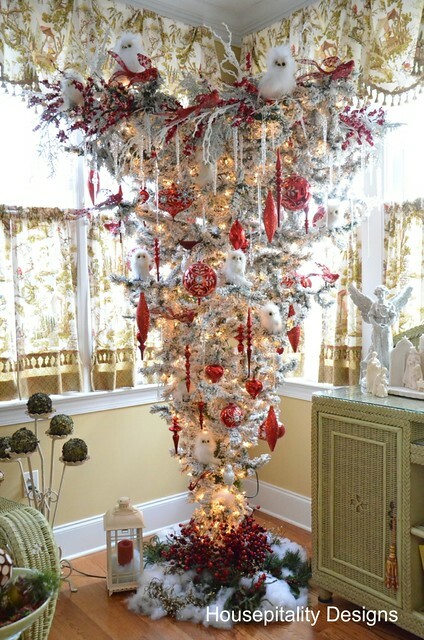 …..I thought I would keep you in suspense and present my large Upside Down Tree. 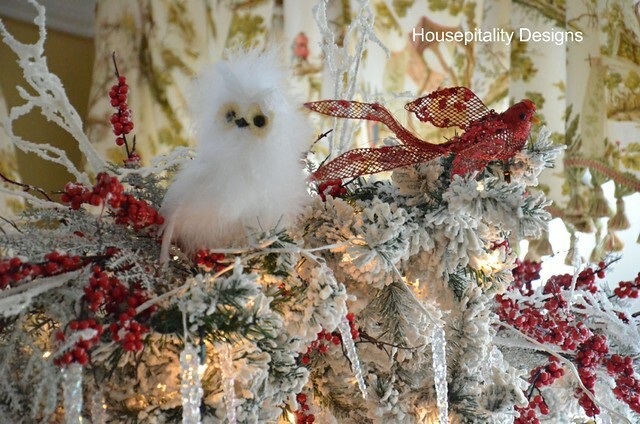 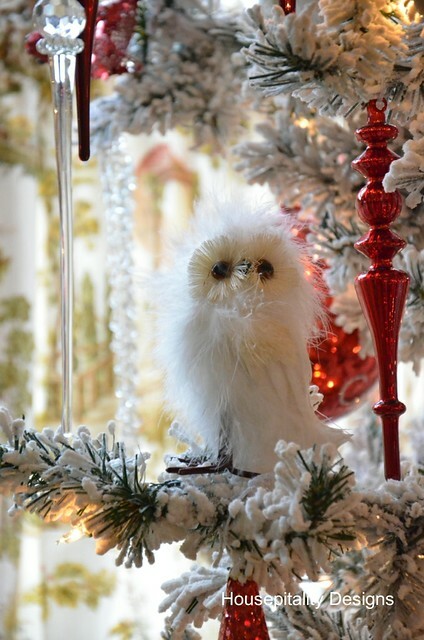 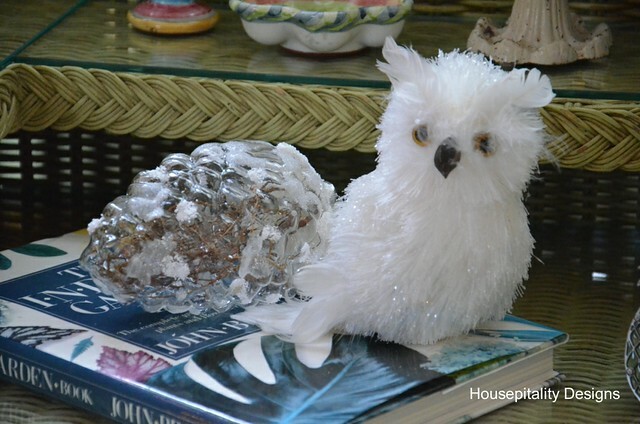 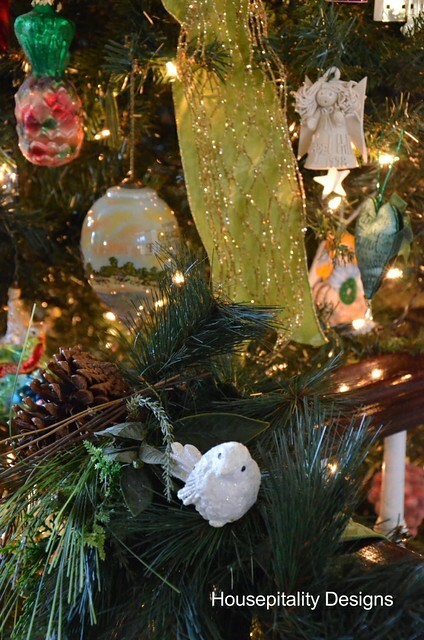 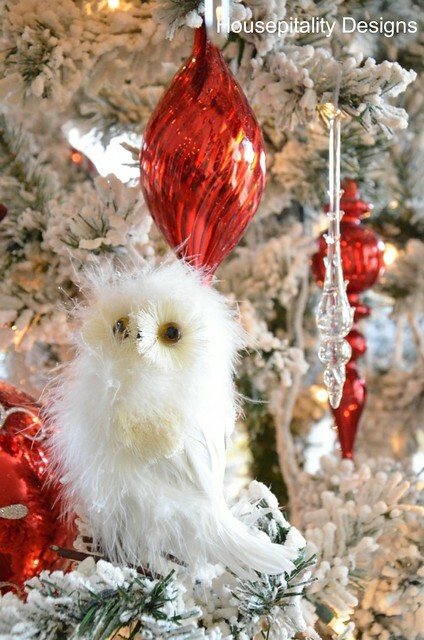 …..It is put together like a regular tree..
…..along with these cute little owls and birds..
A view of the sunroom….. 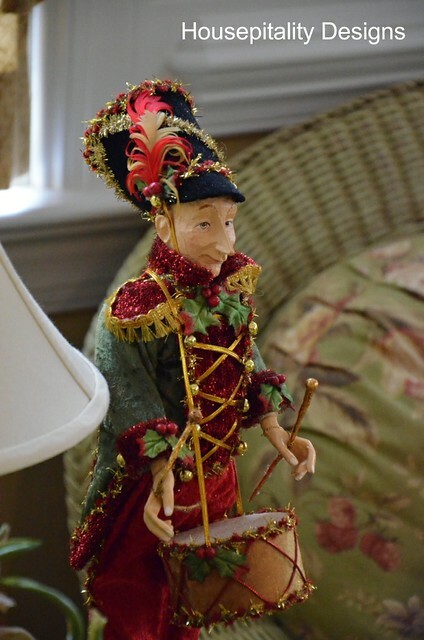 …..I am certain you all can relate!! 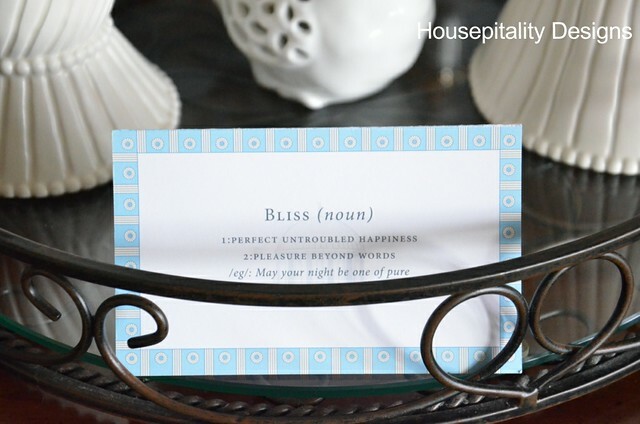 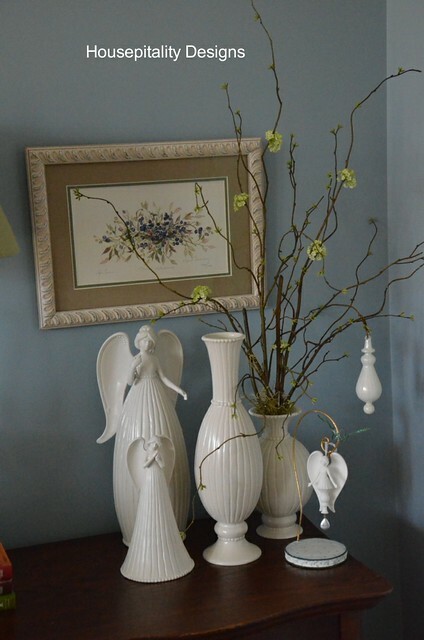 A few “tidbits” around the room…. 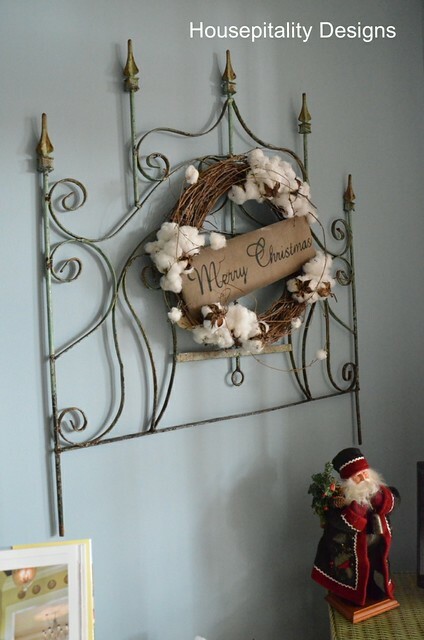 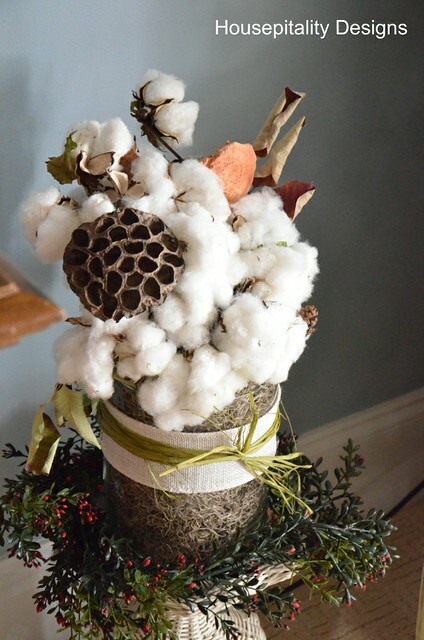 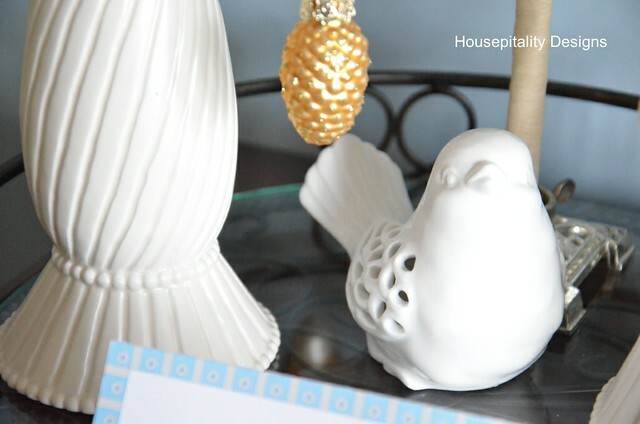 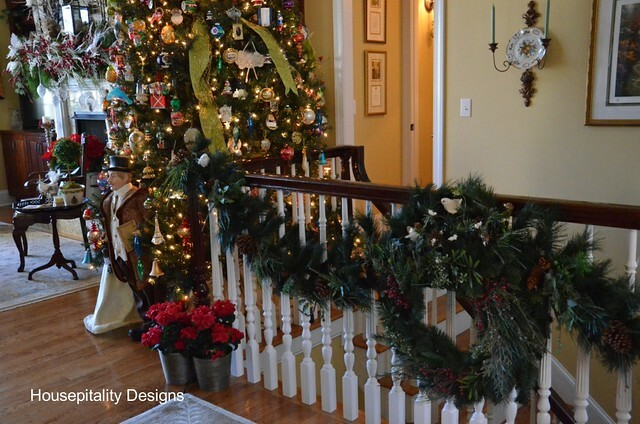 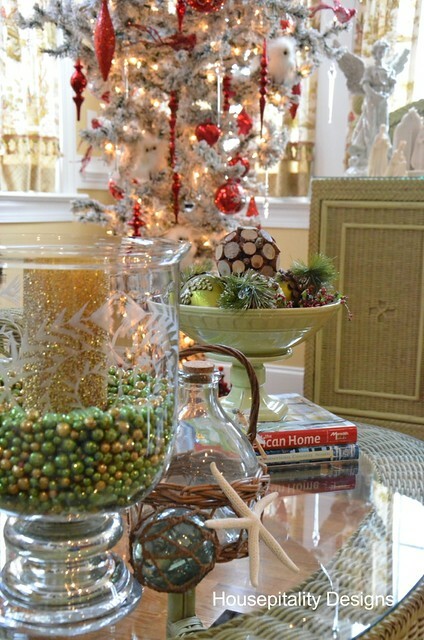 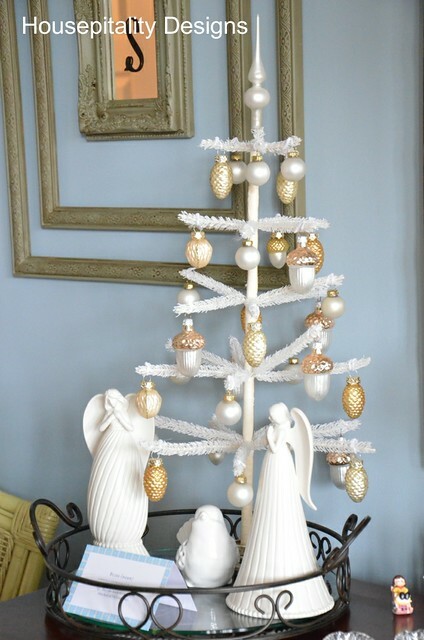 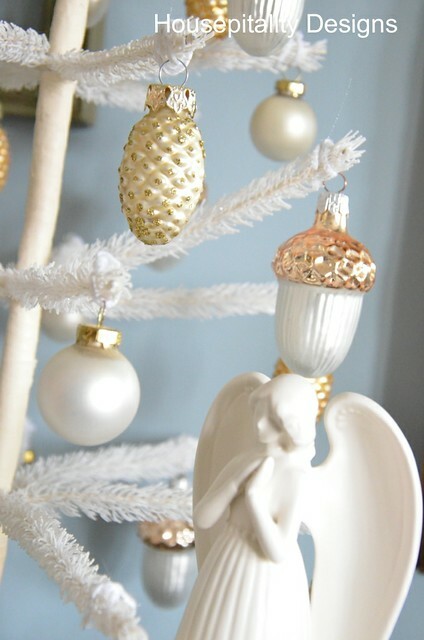 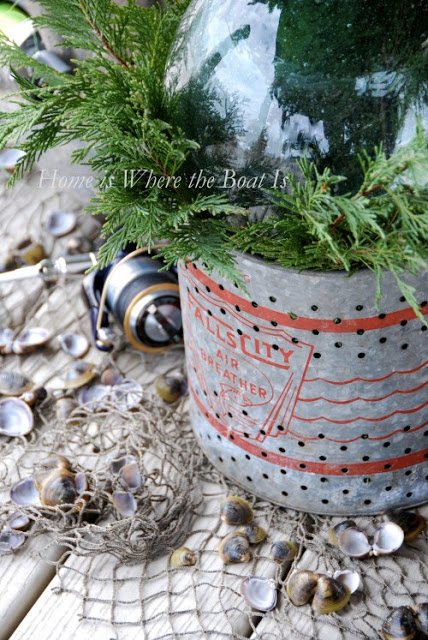 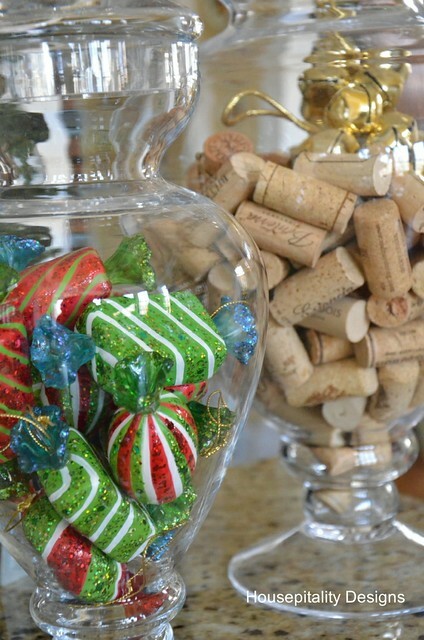 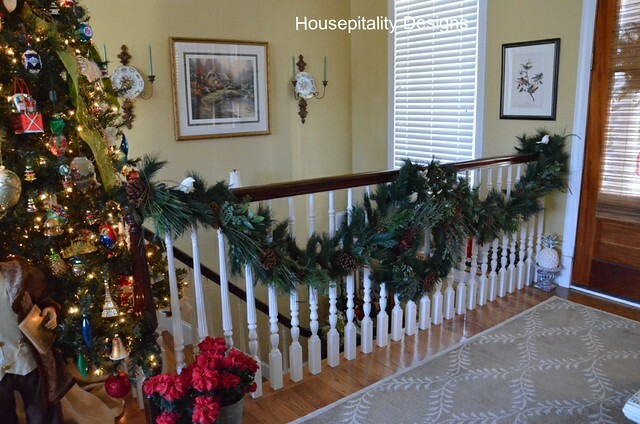 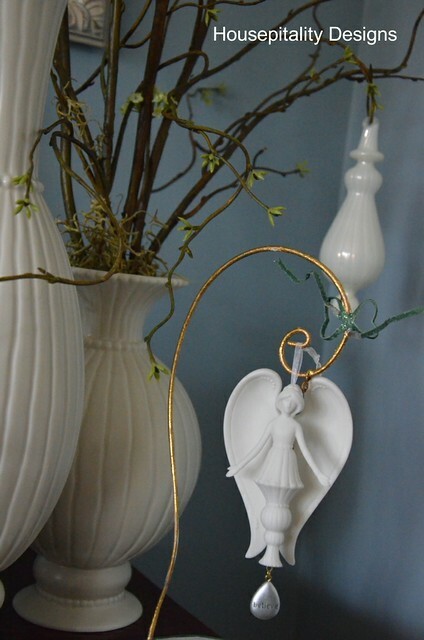 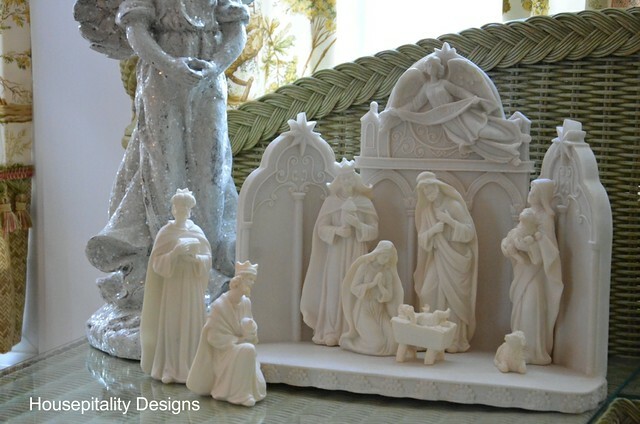 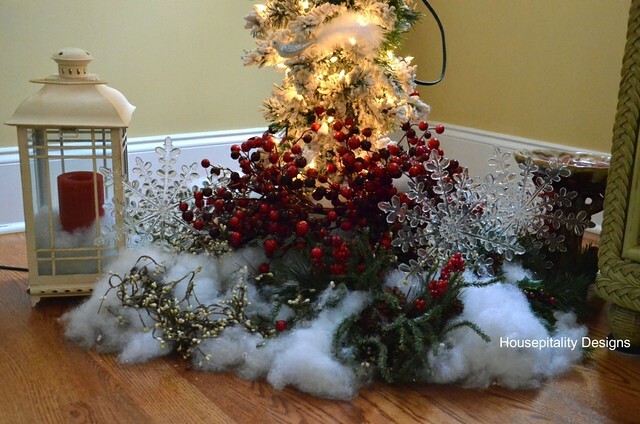 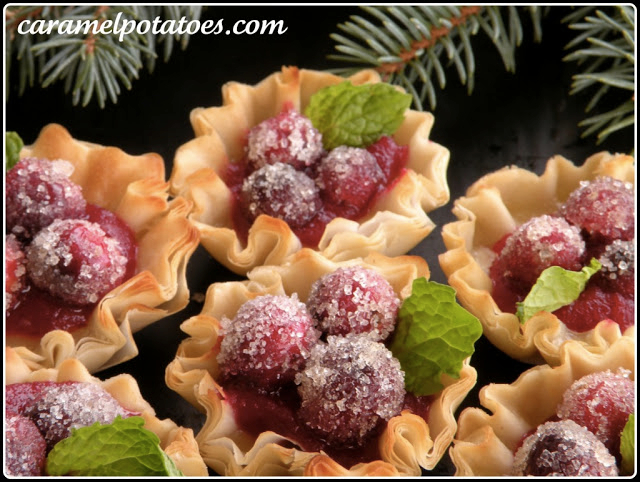 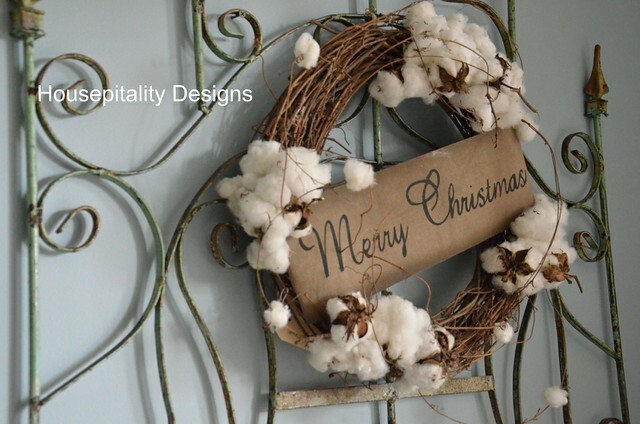 …..Do you remember our Linky Party..”Better Late Than Never Christmas Inspirations”?? 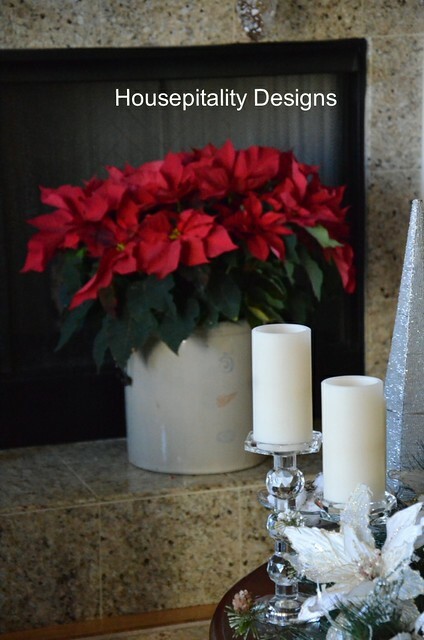 ……….that I participated in with these beautiful fellow bloggers? 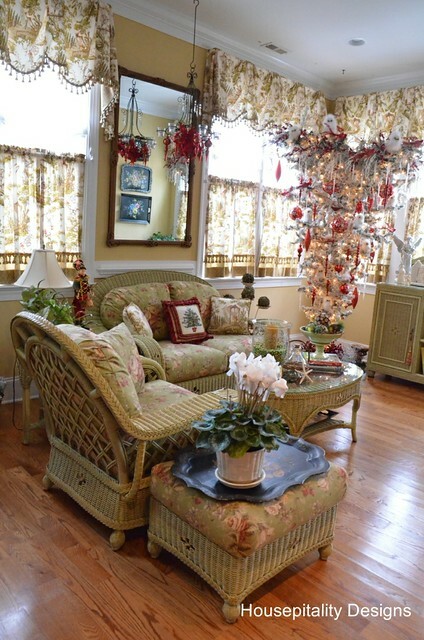 ……….and her garden cottage is out of the world! 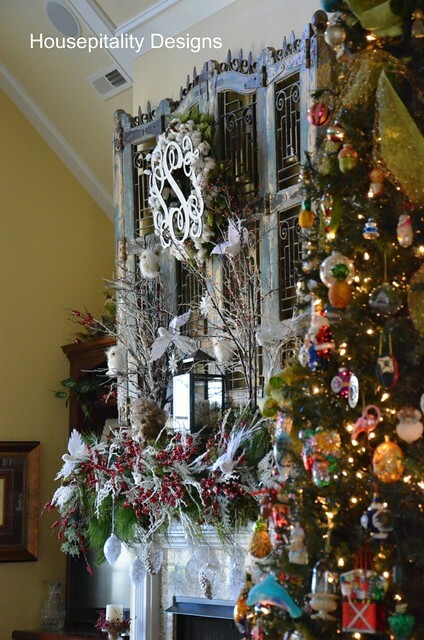 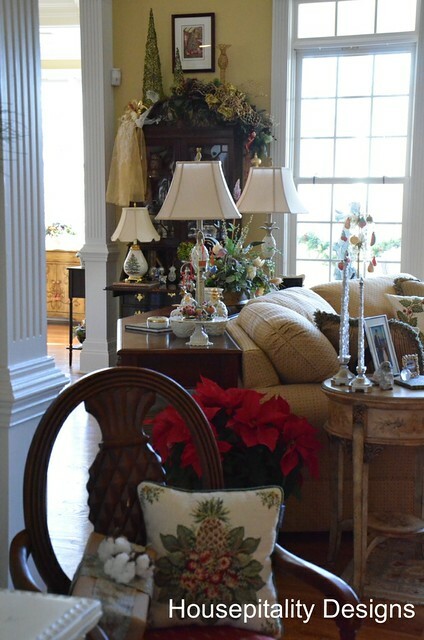 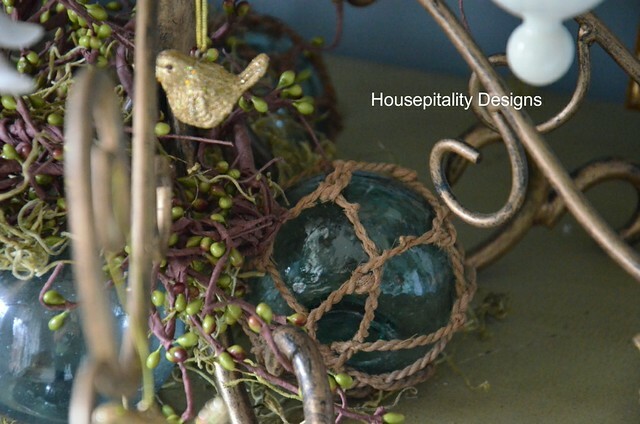 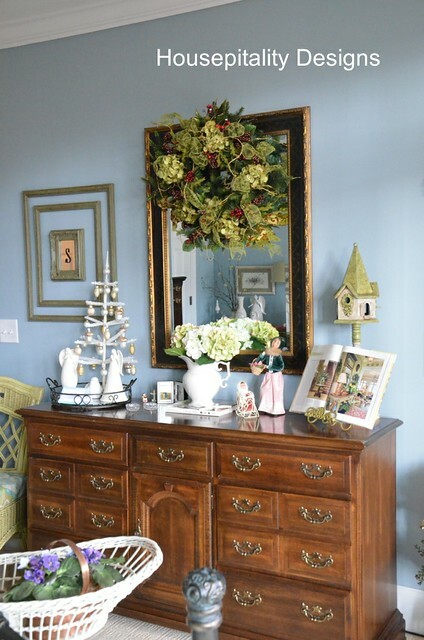 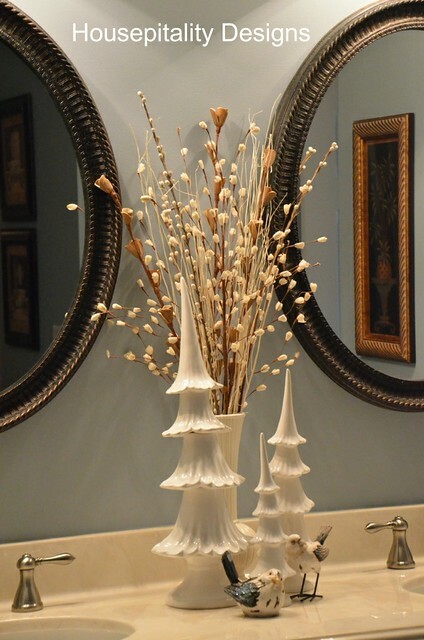 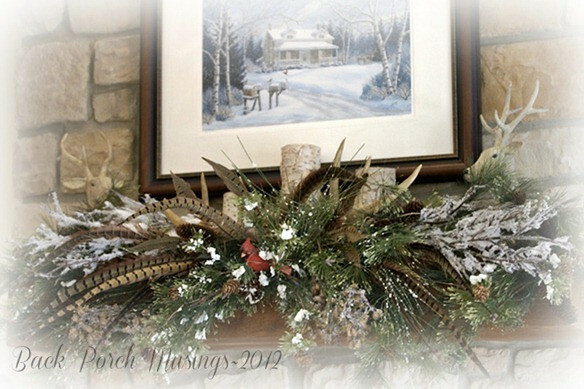 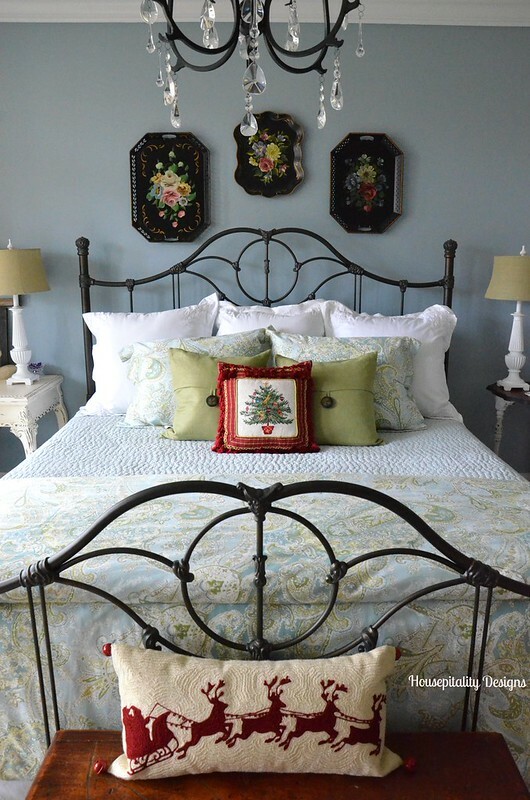 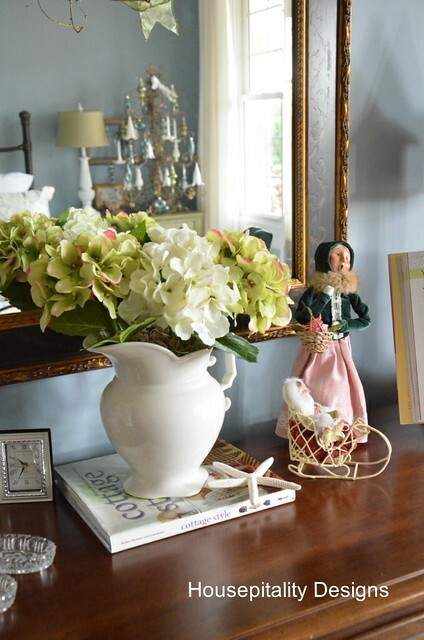 Pat from Back Porch Musings shared her gorgeous mantel…Her home is beautiful..
…..and her photography is perfection. 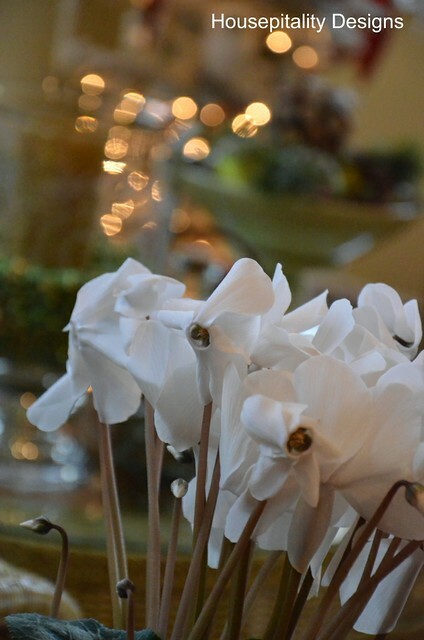 So many wonderful links to the party…I so enjoyed them all…so many great inspirations! 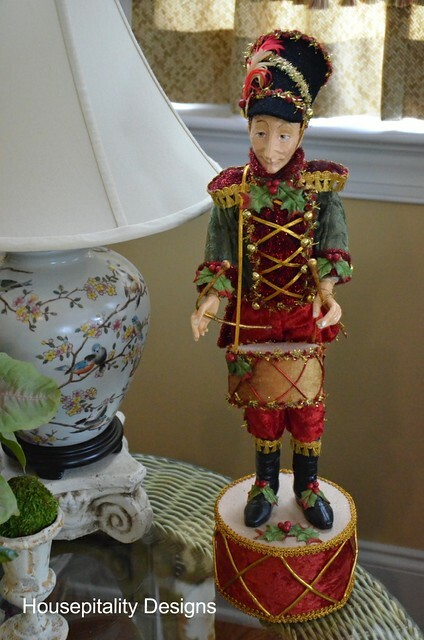 We thank you all for joining the party!!! 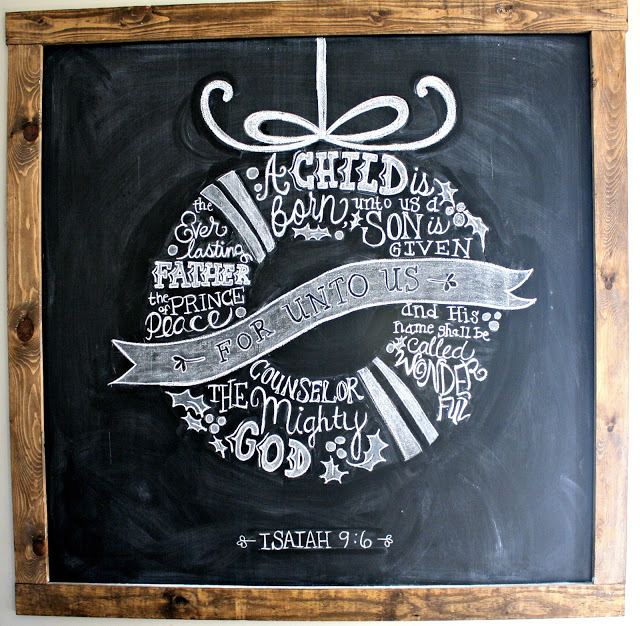 …..For her magnificent Chalkboard Art!!! 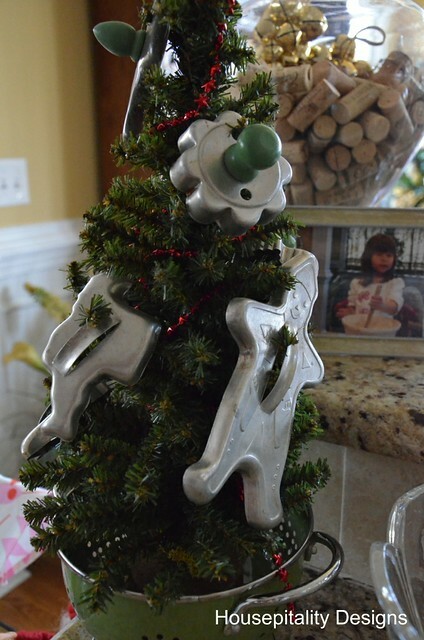 …..I am getting too old for this…need a smaller tree! 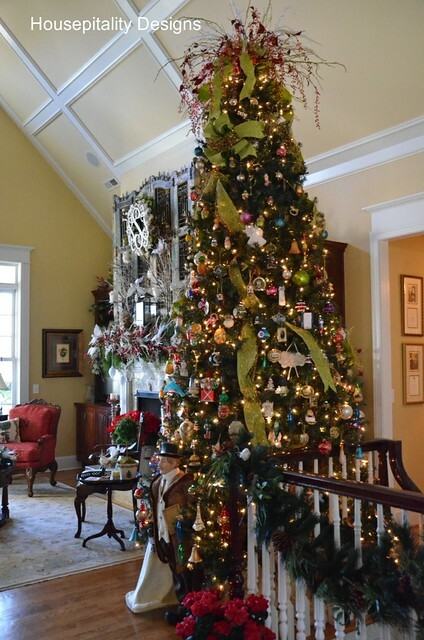 However, it looks so “majestic” with the height of the ceiling. 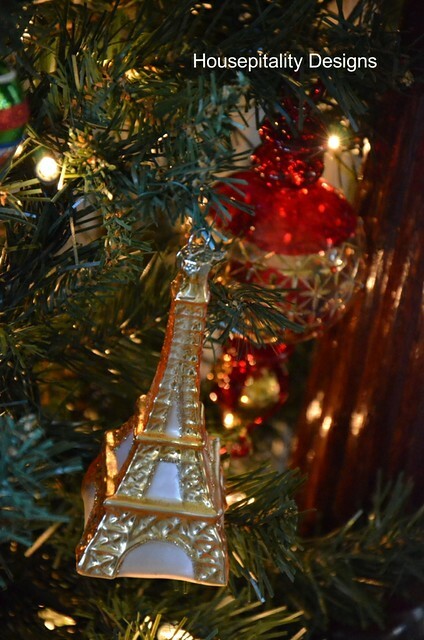 …..for a little more bling! 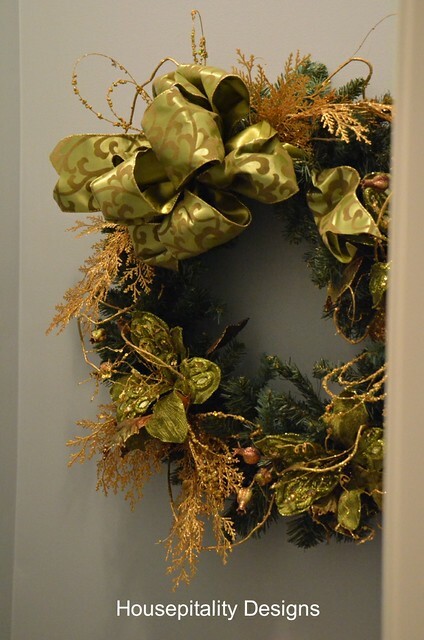 Rather than embellishing the garland with ribbon, etc.. 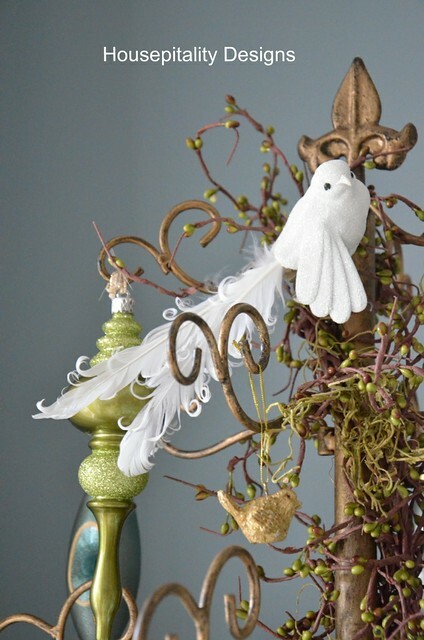 …..I chose to leave it natural..adding a few birds here and there. 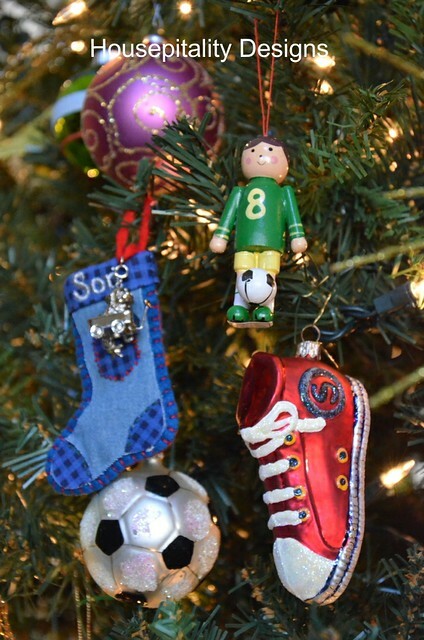 …..like this “vignette” for my son…he played soccer…still does! 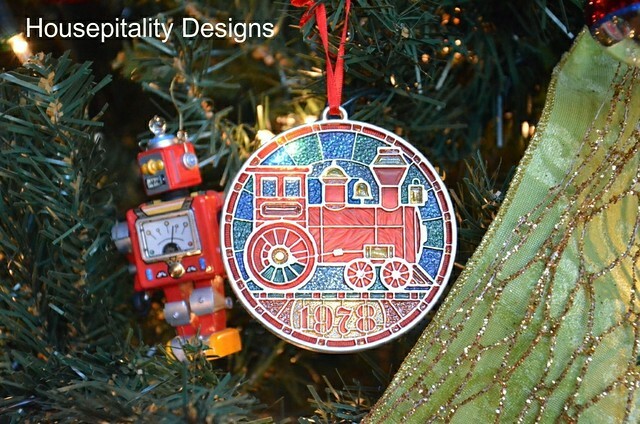 The train “stained glass” ornament was my very first Hallmark ornament purchase! 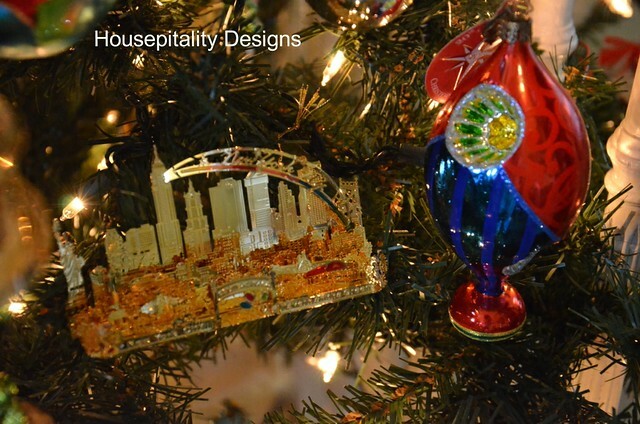 …..bought this one on one of our “Christmastime” trips to NYC. 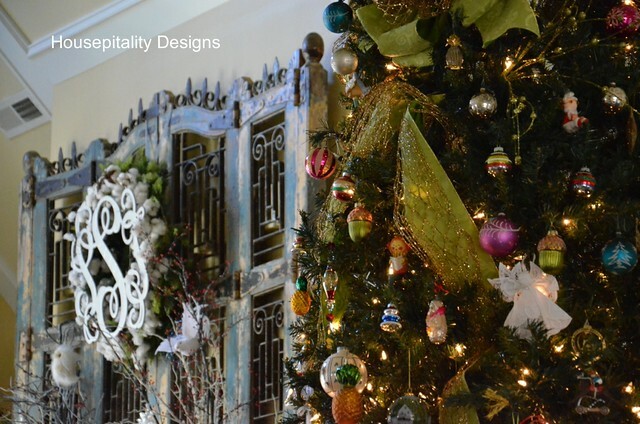 Tavern on the Green…so enjoyed our lunch there…so sad it is gone! 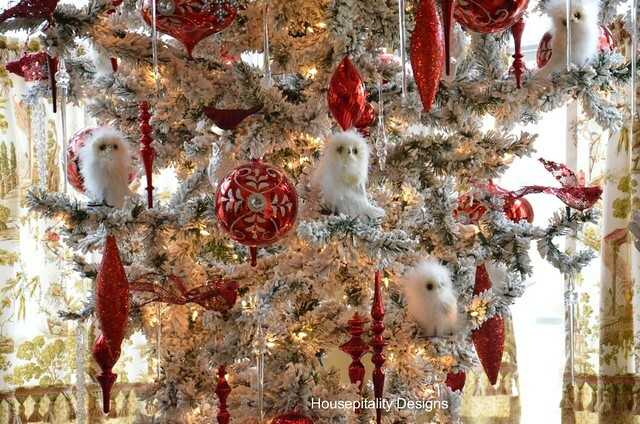 So if I concentrate on this enough…I may someday go…hope so K & K!! 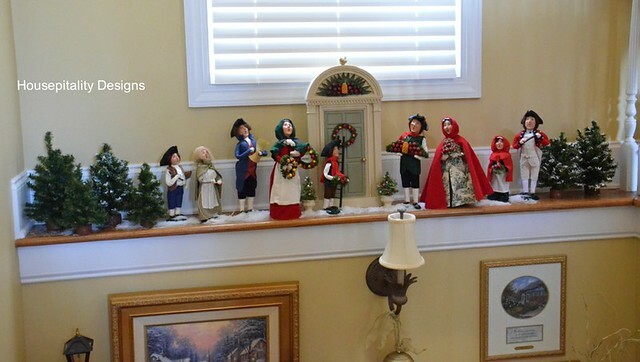 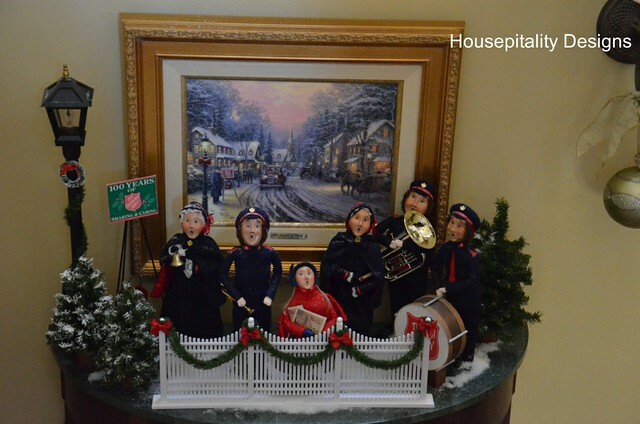 I love my set of carolers that I place around the tree.. 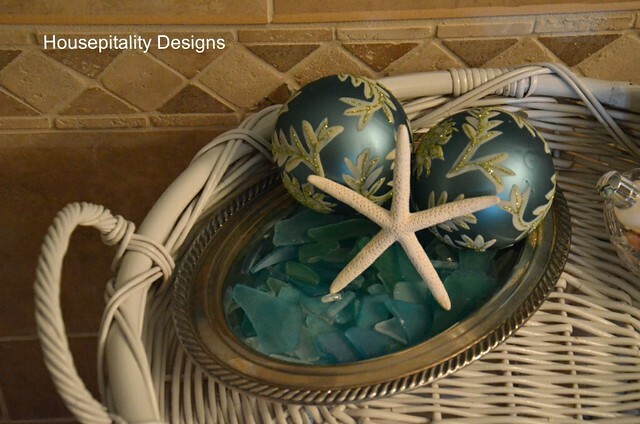 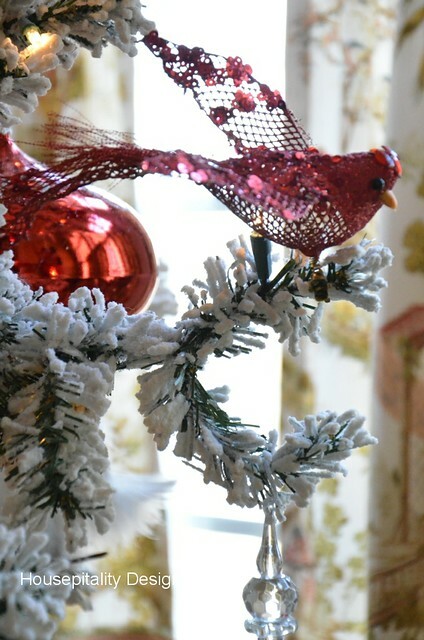 I embellished my existing decor..something that I am going to do more of next year.. 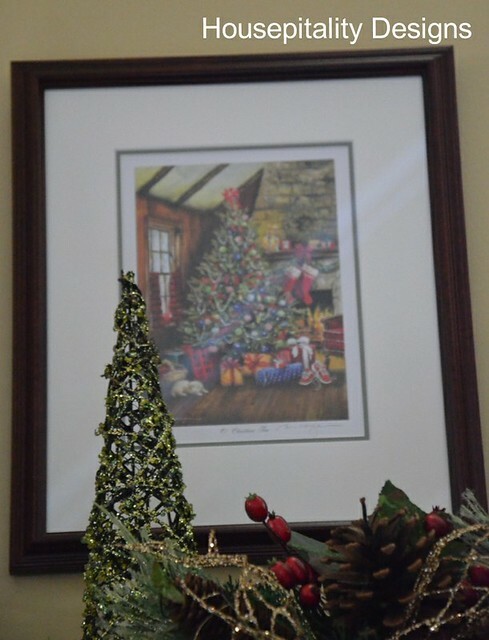 The top of the secretary..I made the swag/garland..
…..and the print is a gift from my friend Sherry…the artist is from N.C.! 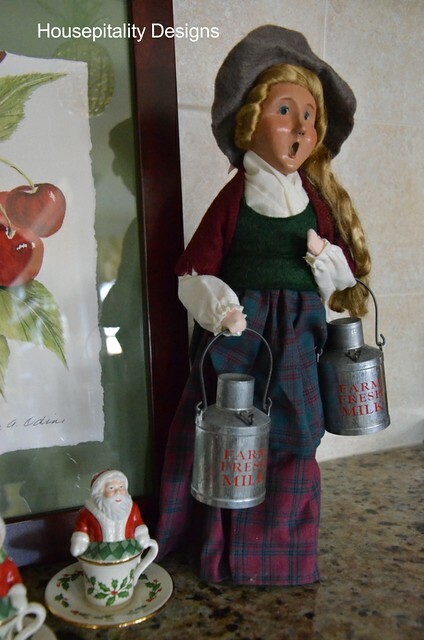 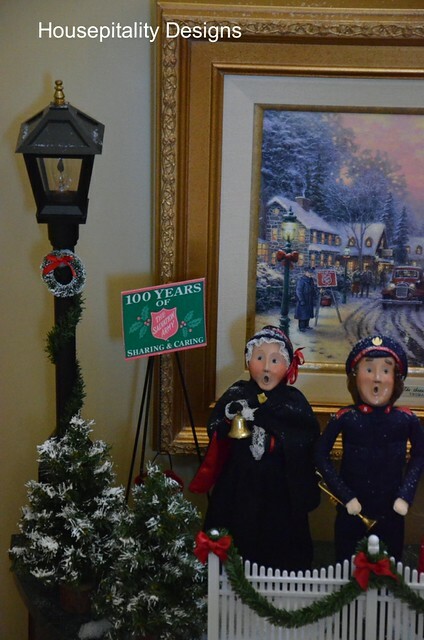 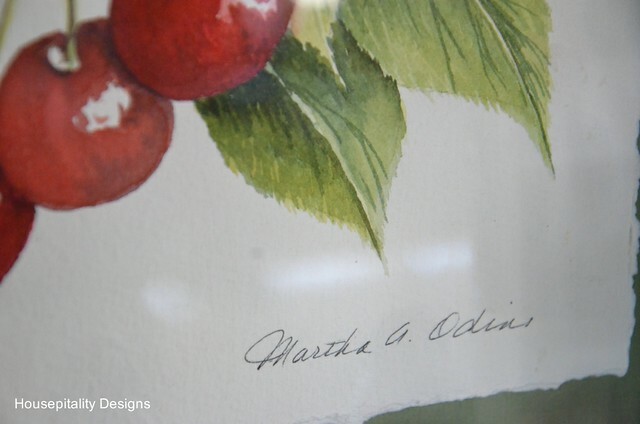 Glad you are hanging in with me with all these pics…have lots to share..
My Salvation Army Collection…below the Thomas Kincaid limited edition he painted after 911. 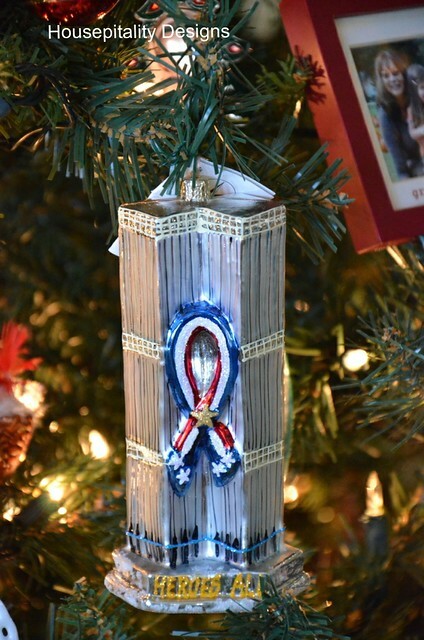 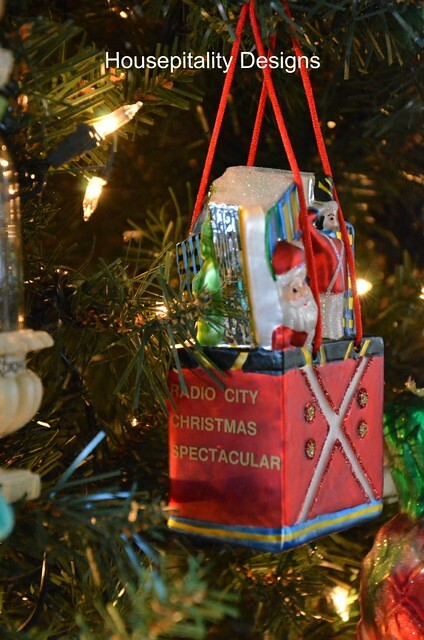 And I leave you with one of my favorite Radko Ornaments…. 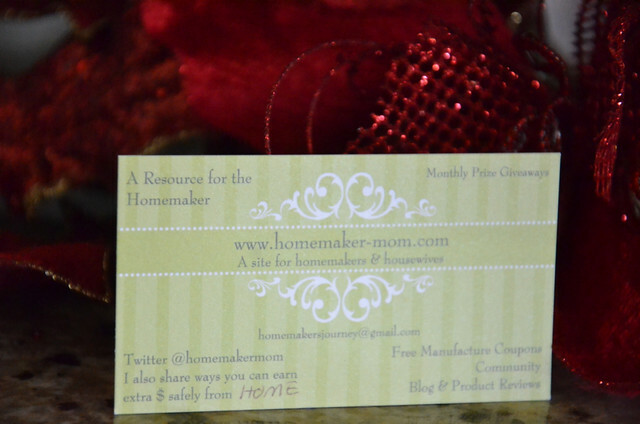 …..so that I can move forward with shopping, cards, and party preps. 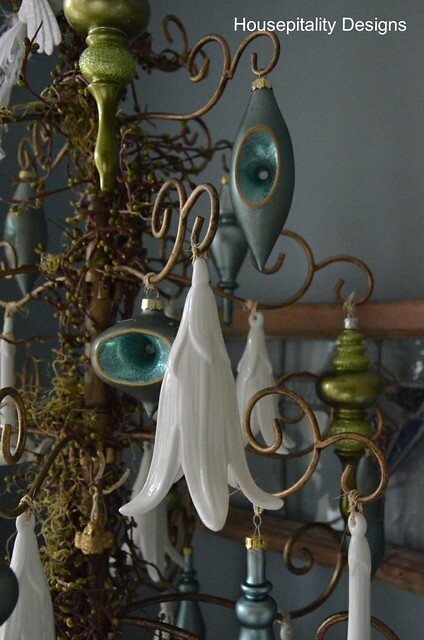 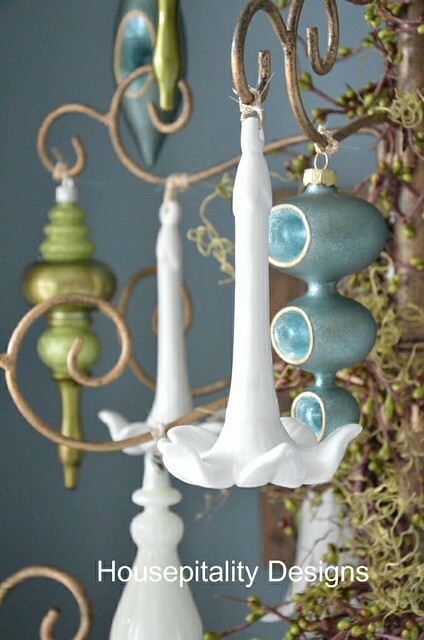 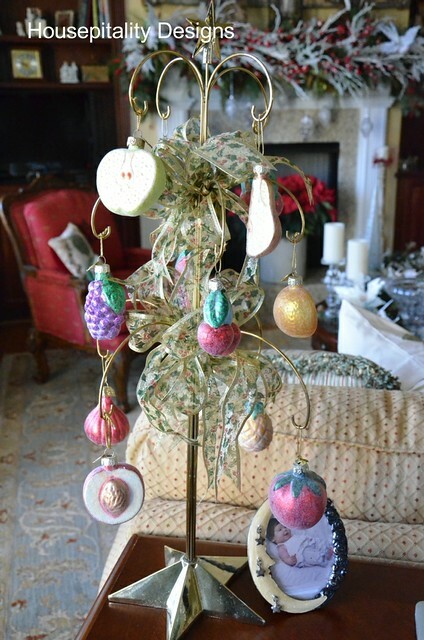 …..and two beaded garlands of bells..
…..using them in different places each year. 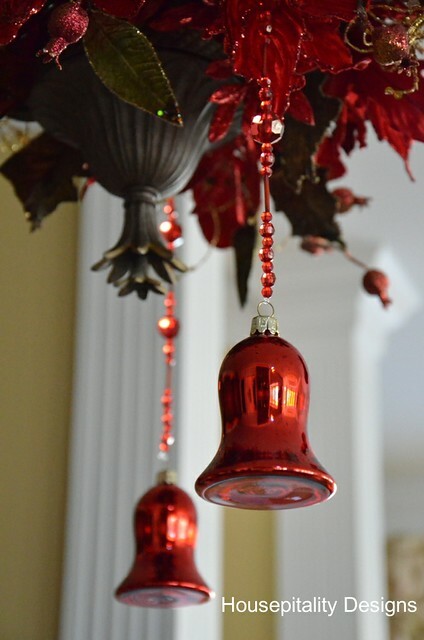 “I heard the bells on Christmas Day..the old familiar carols play…”…. 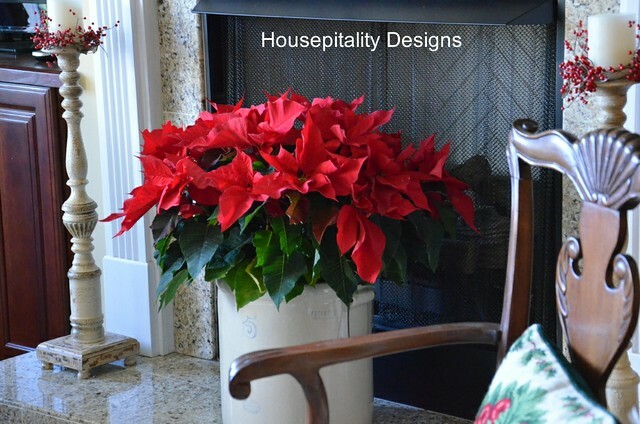 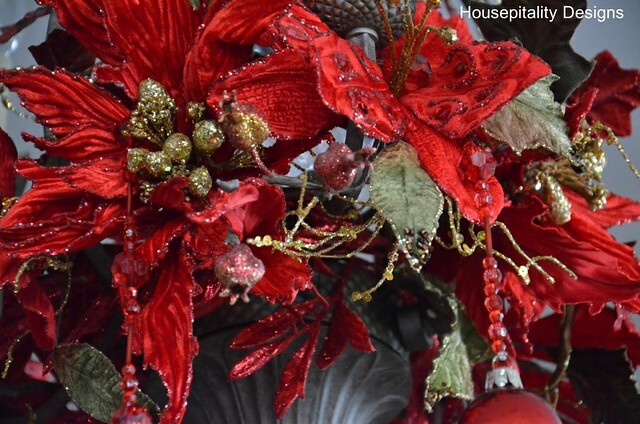 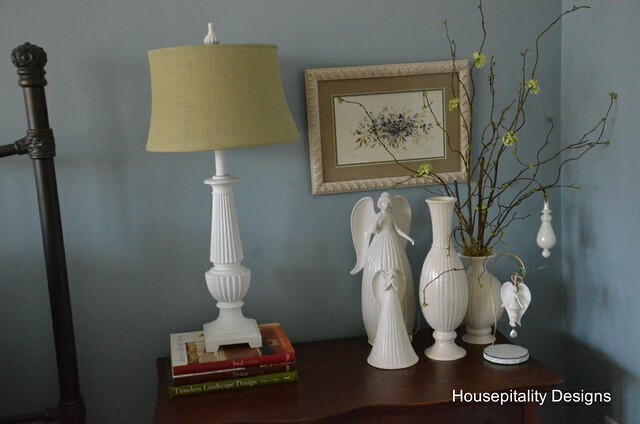 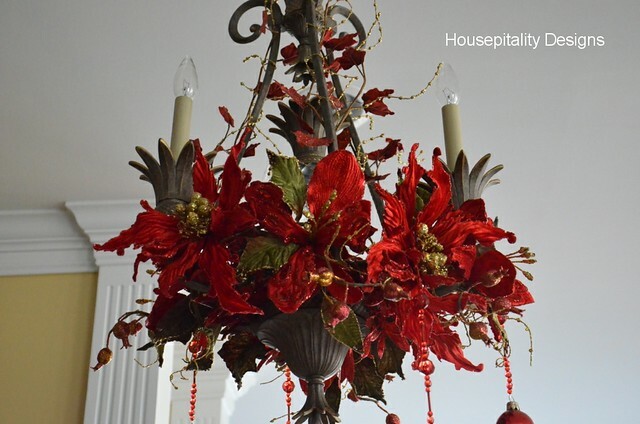 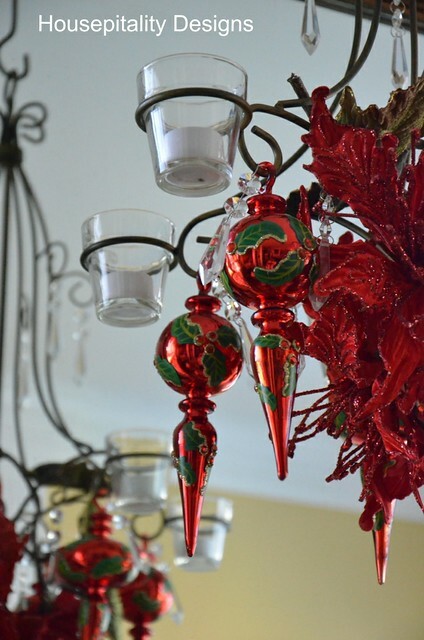 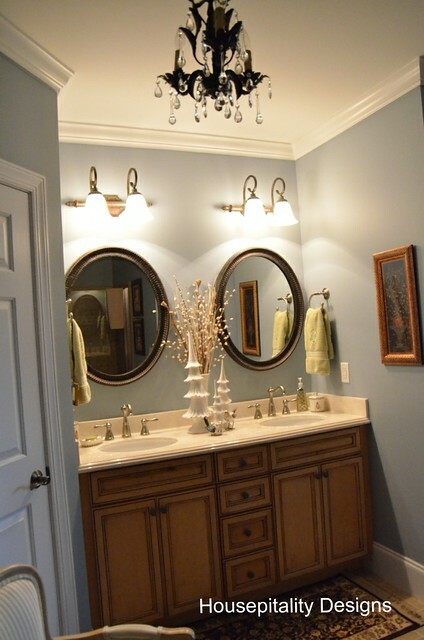 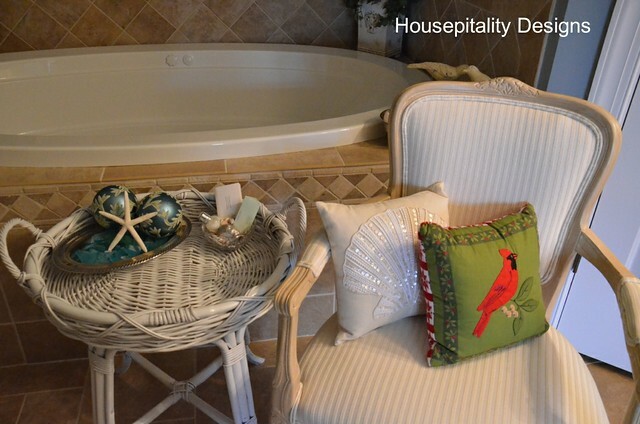 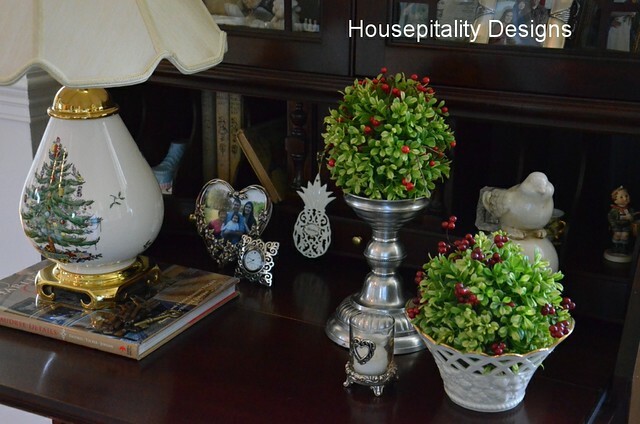 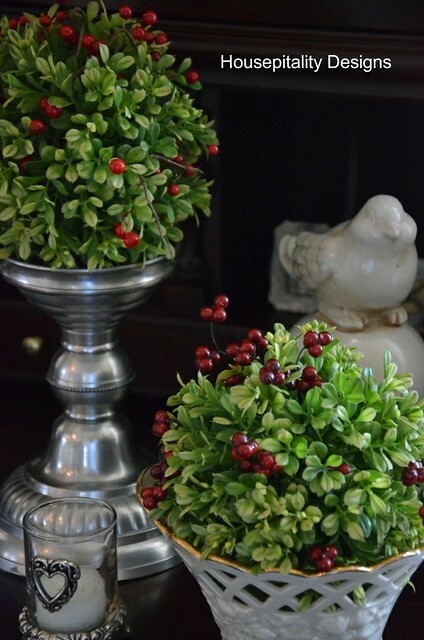 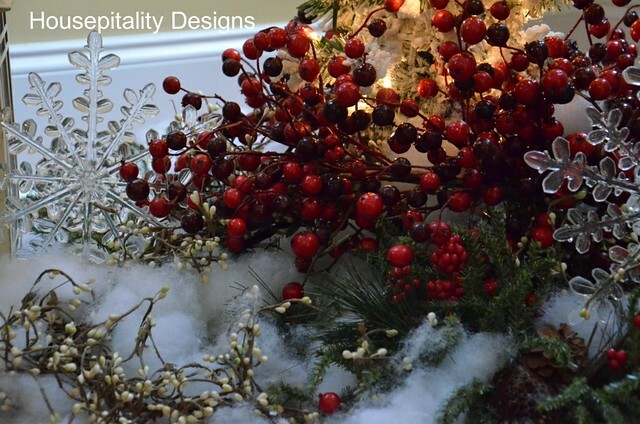 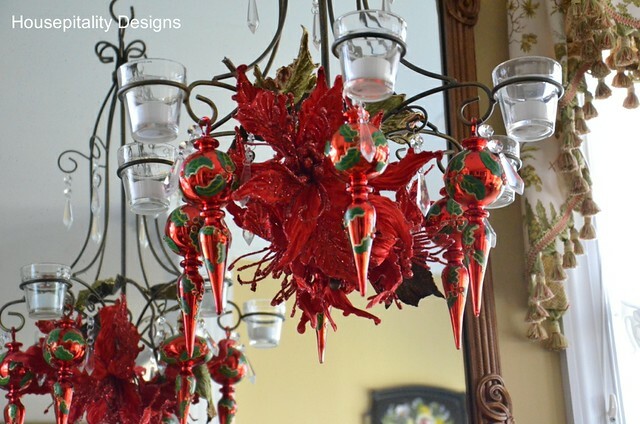 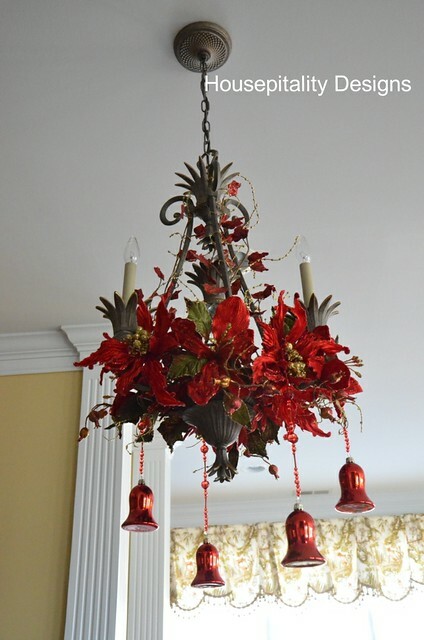 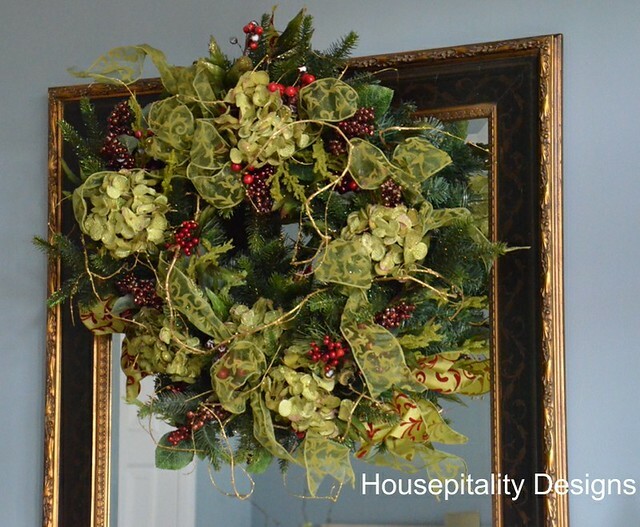 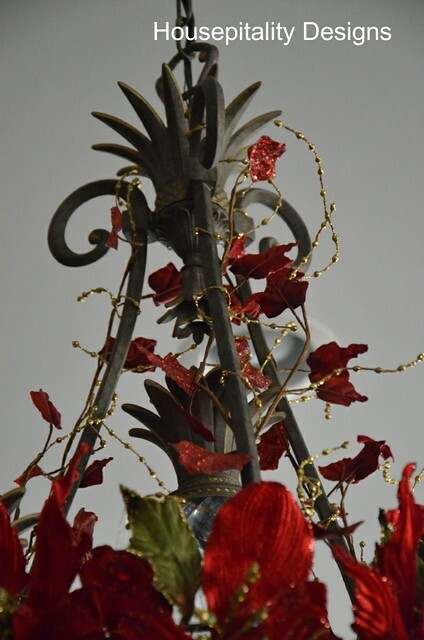 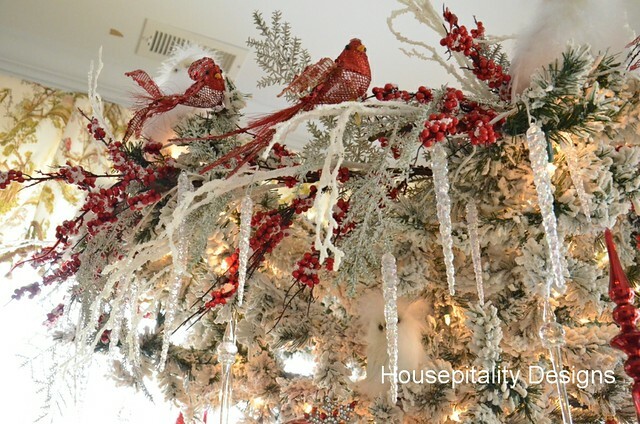 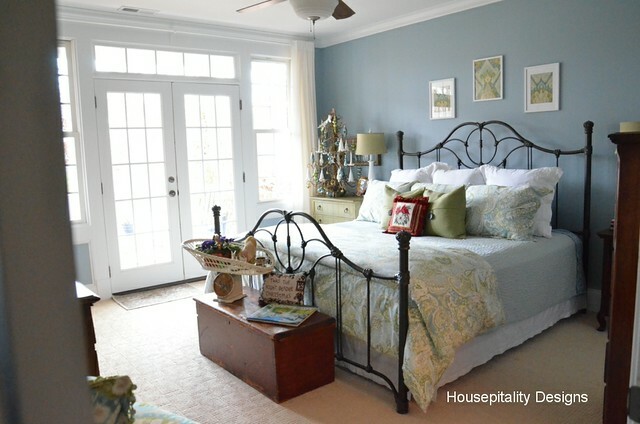 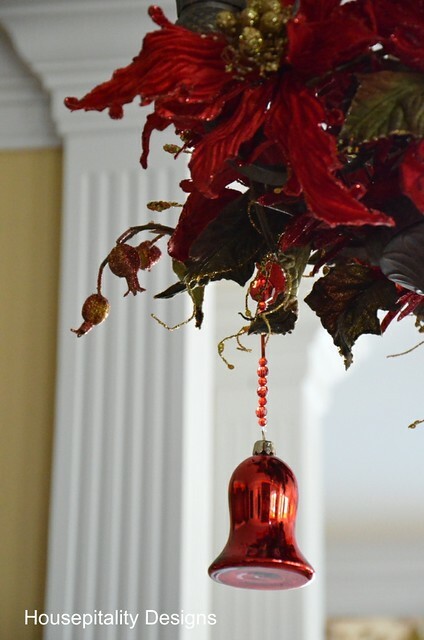 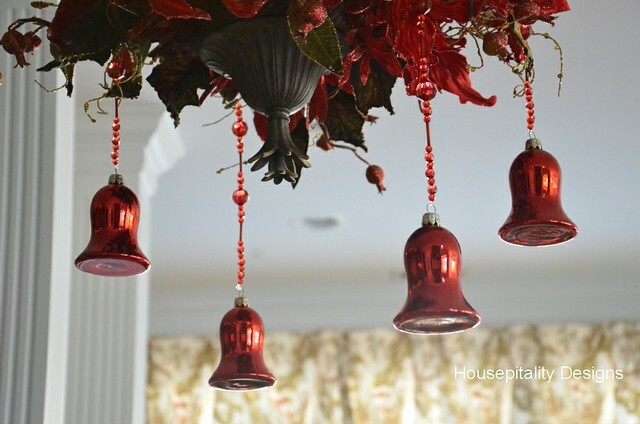 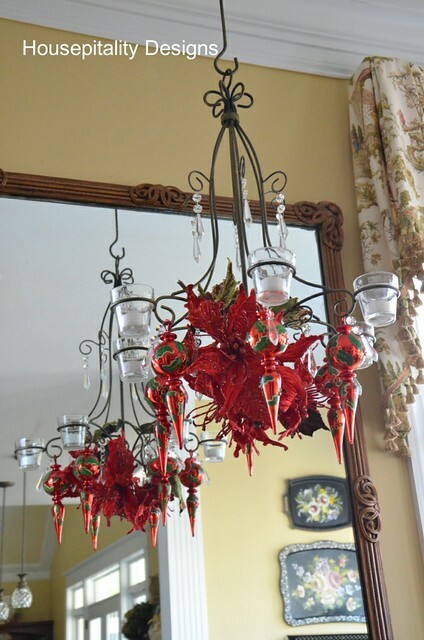 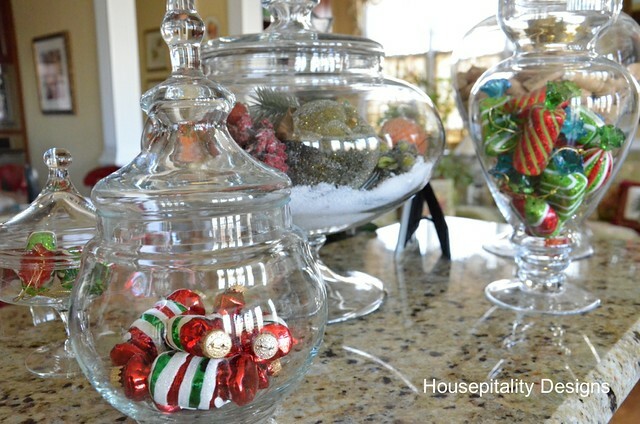 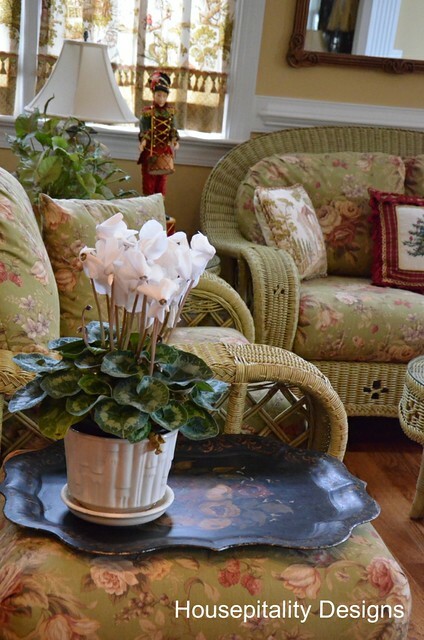 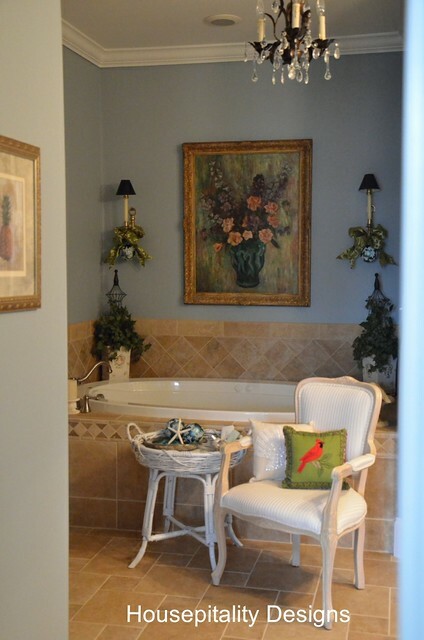 …..I have splashes of red in the kitchen and sun room…so these do well in the chandy.. 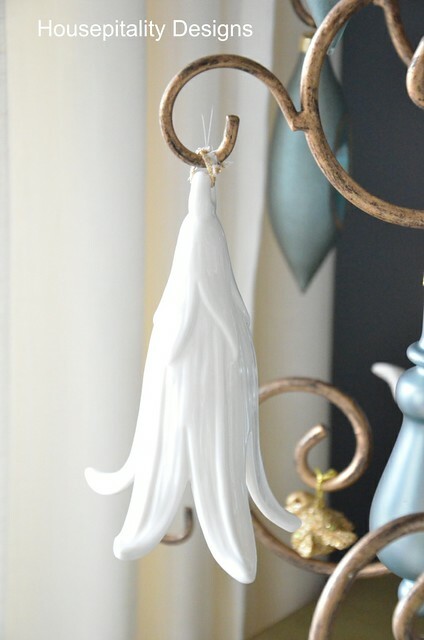 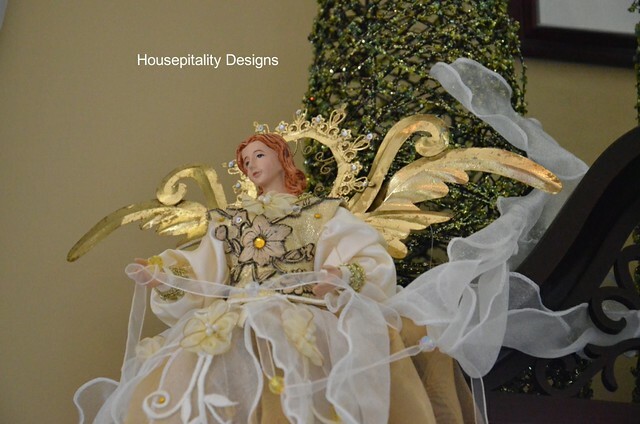 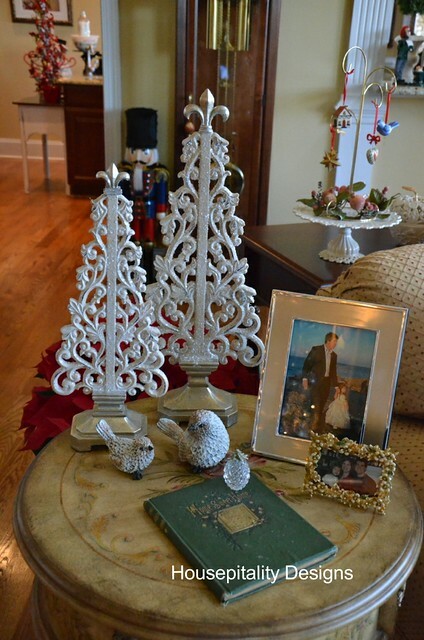 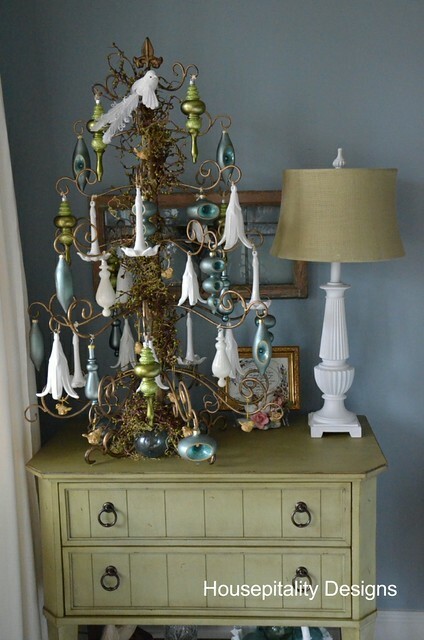 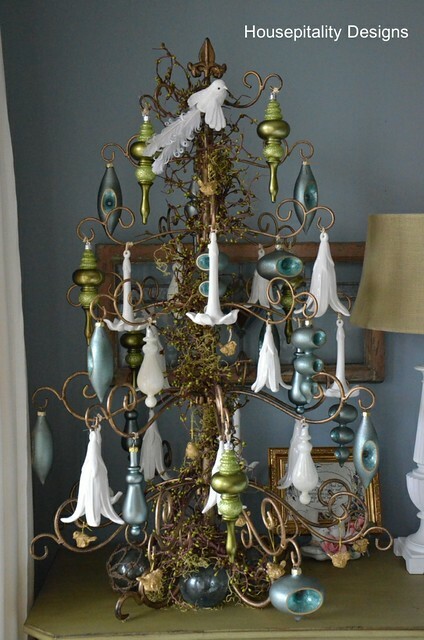 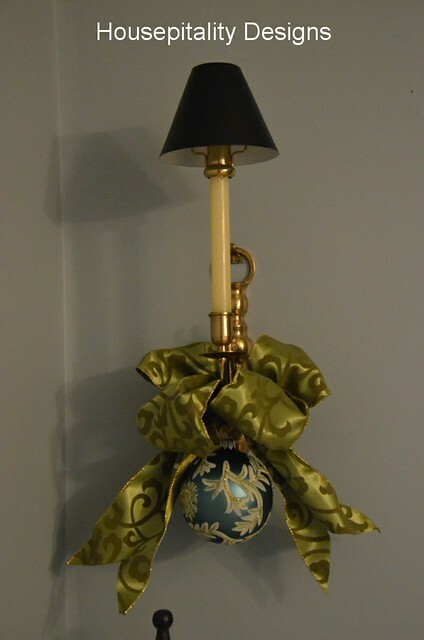 …..I added ornaments to the arms of the candelabra and placed floral picks at the base. 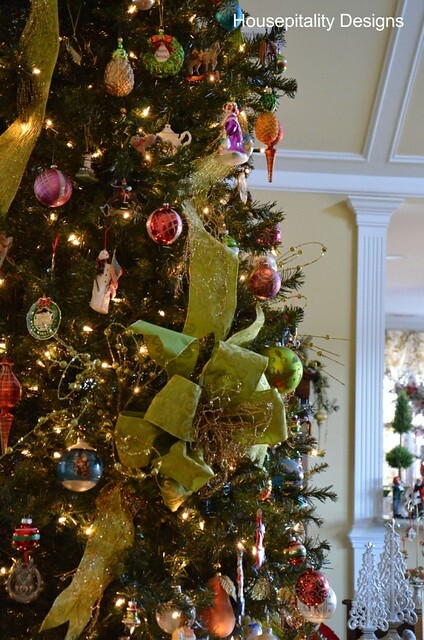 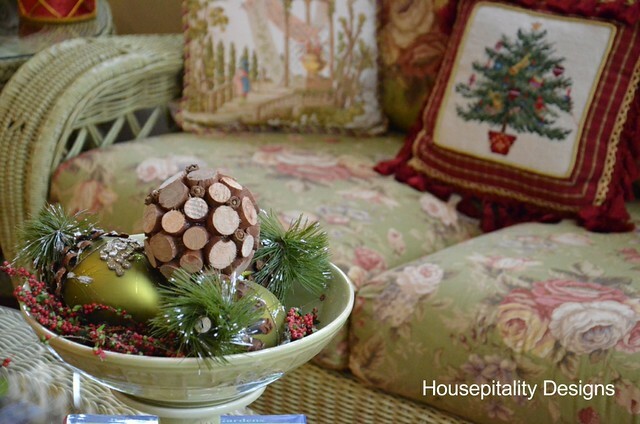 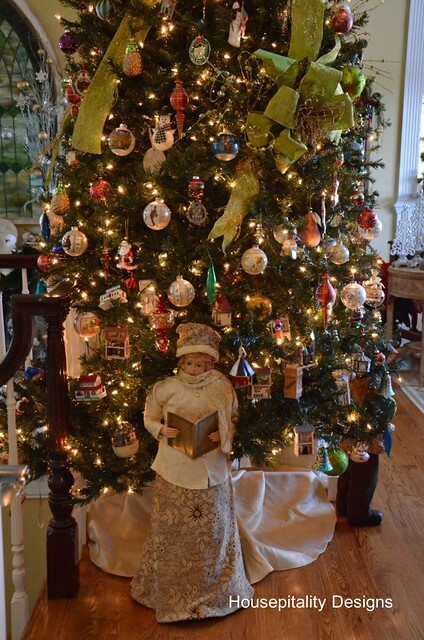 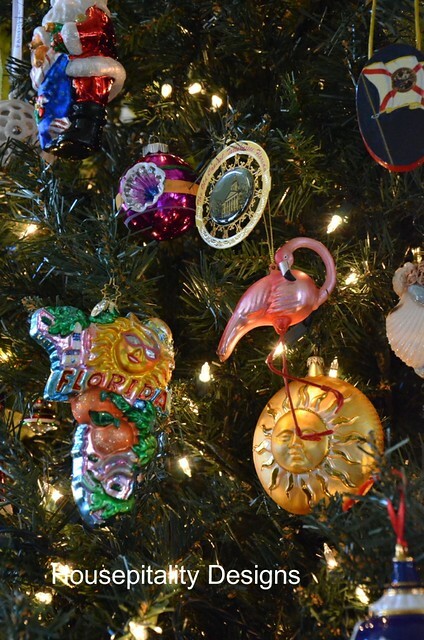 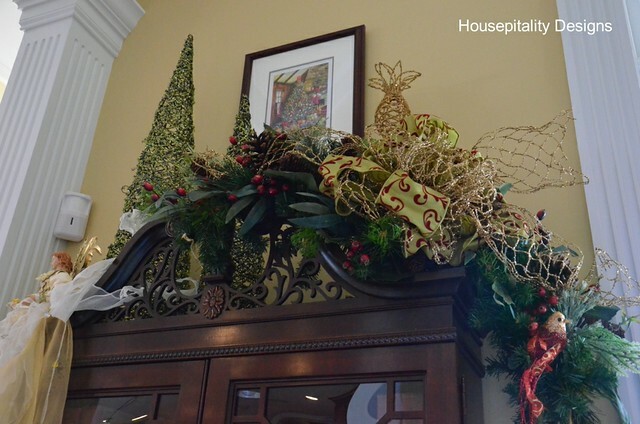 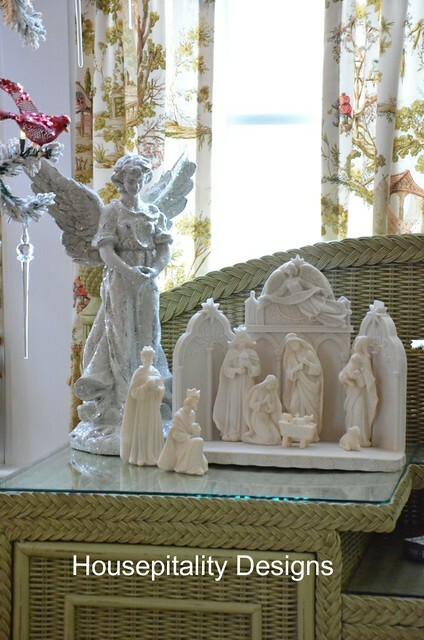 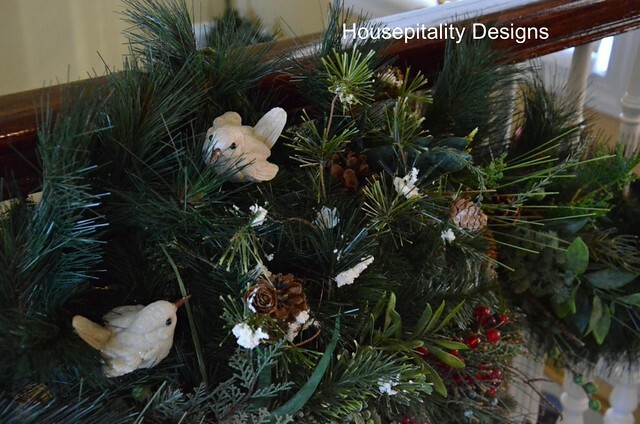 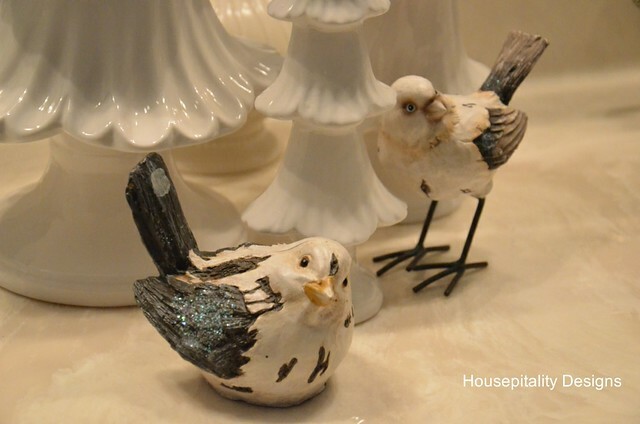 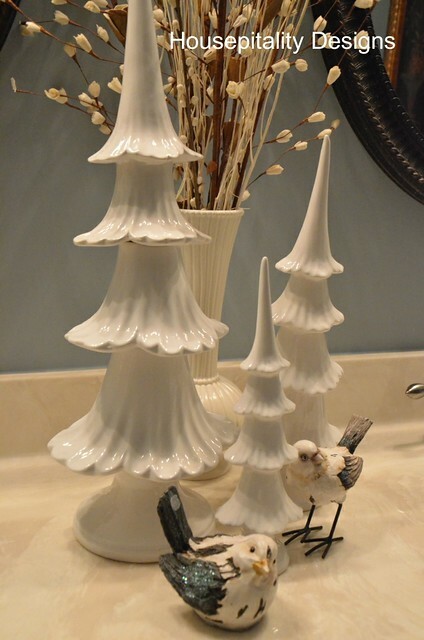 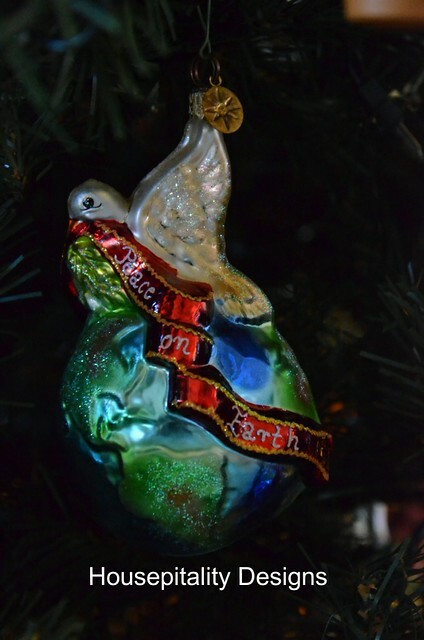 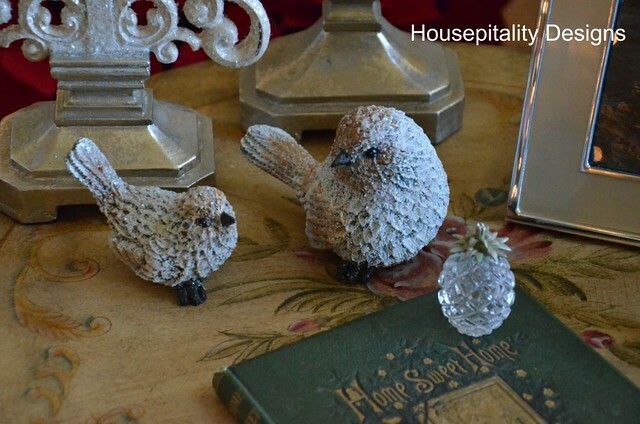 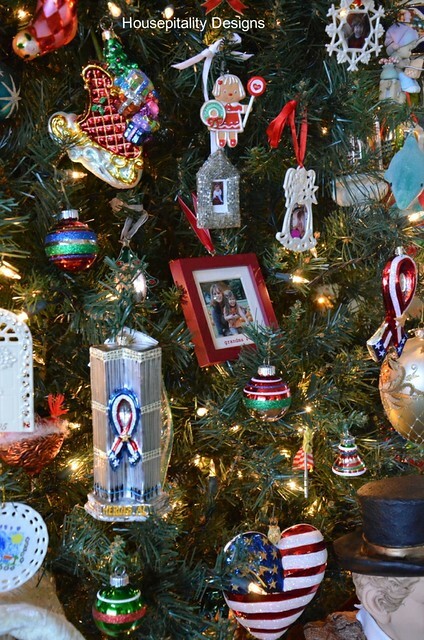 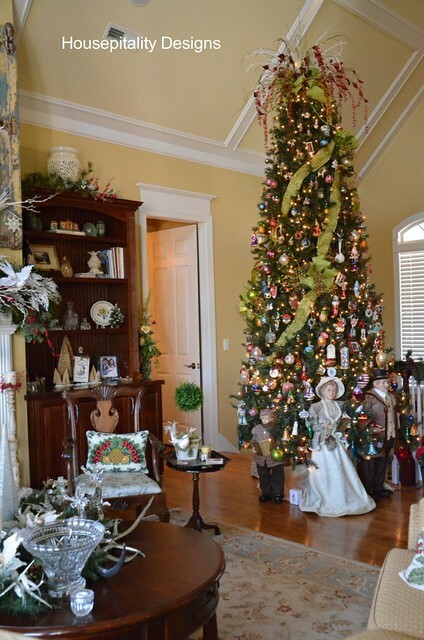 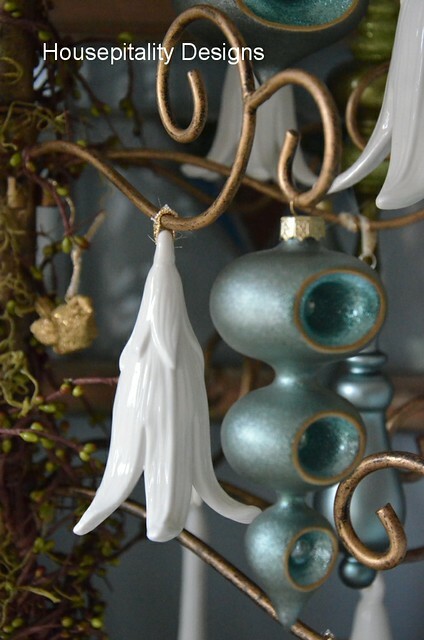 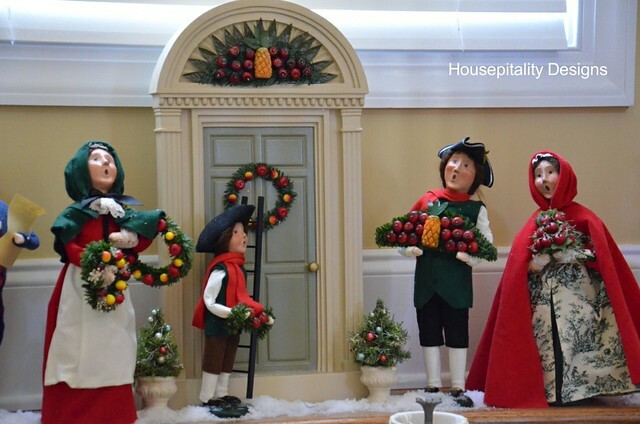 I bought the ornaments when visiting the Biltmore House in Asheville…they had a great sale! 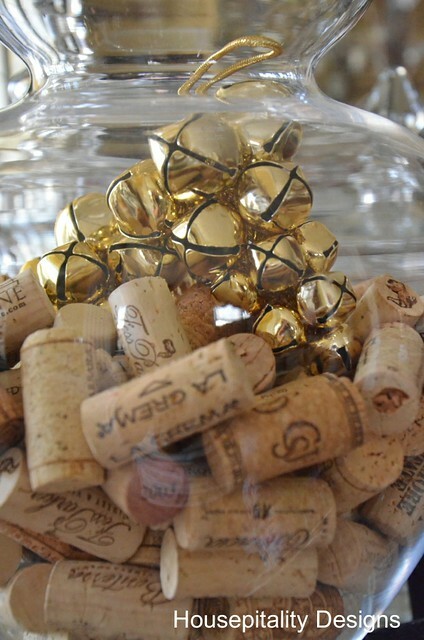 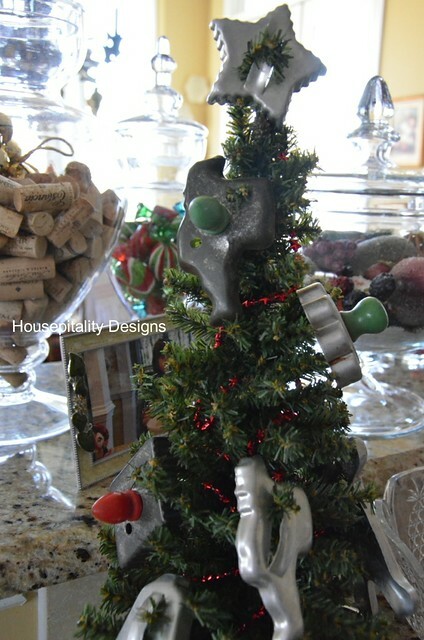 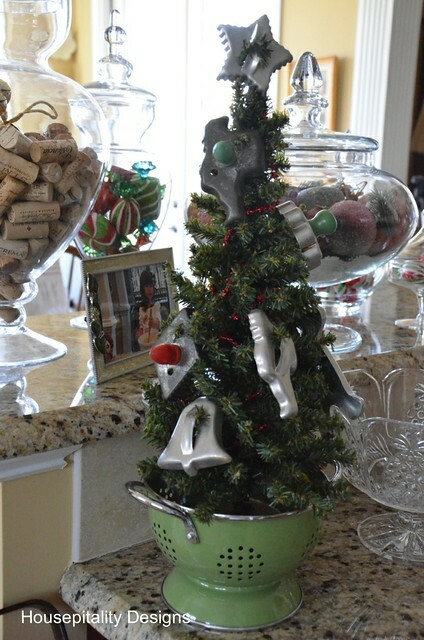 Here is my cookie cutter tree…placed in a mini colander..
….and sugared fruit…bells shaped into a bunch of grapes lay in the jar with the wine corks! 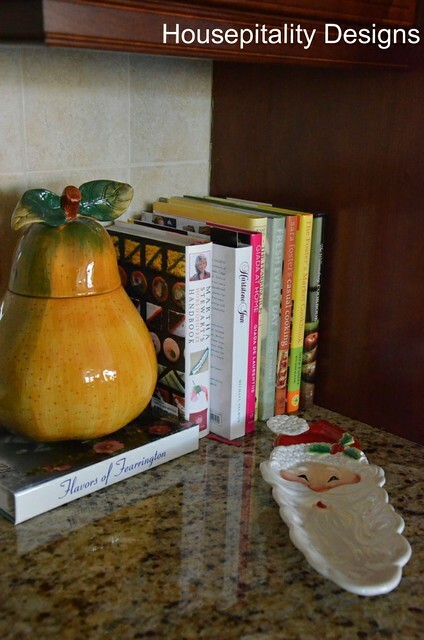 And now we move on to the other side of the kitchen…. 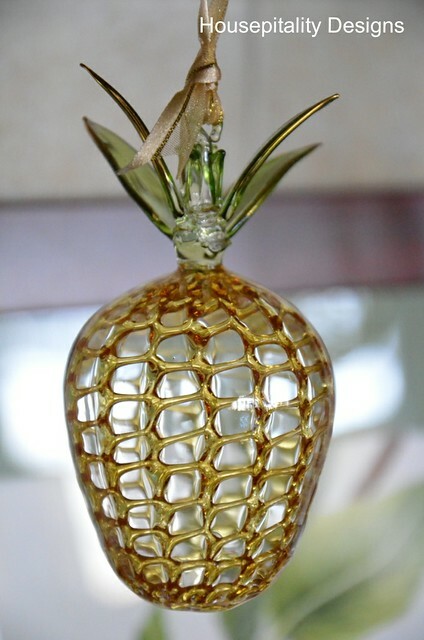 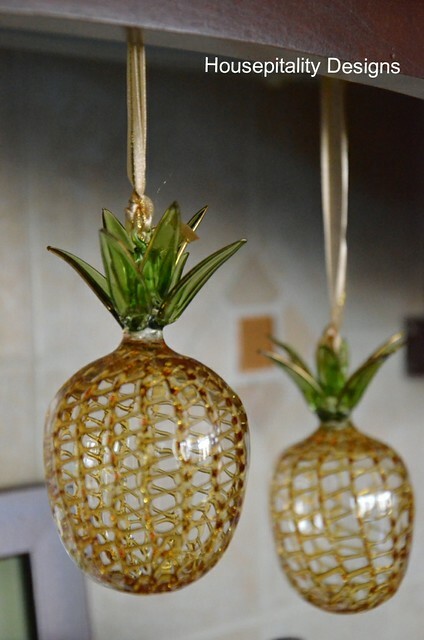 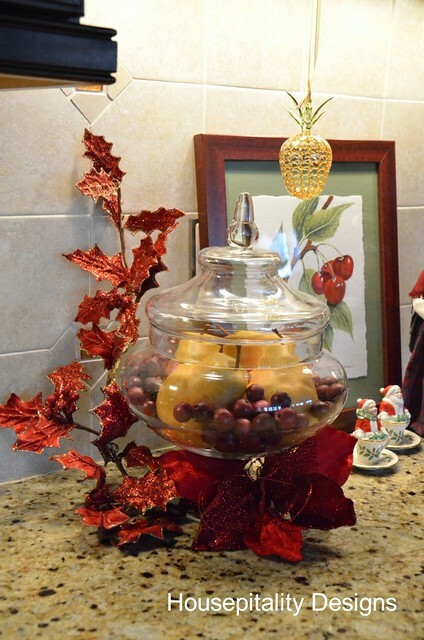 ……………crystal pineapples hang from beneath the cabinetry. 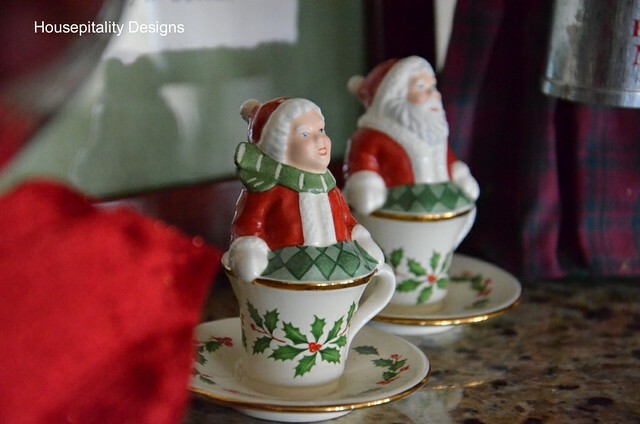 What’s a kitchen without Mr. and Mrs. Claus Lenox Salt and Pepper Shakers!! 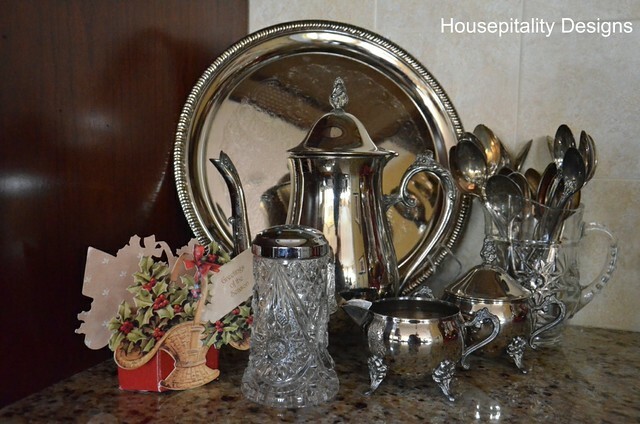 And another thing I need to do….CLEAN THE SILVER!!! 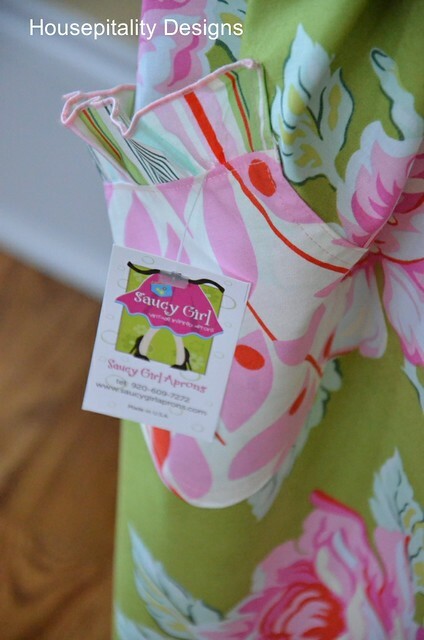 …..and here is the apron I received….It is so cute!!! 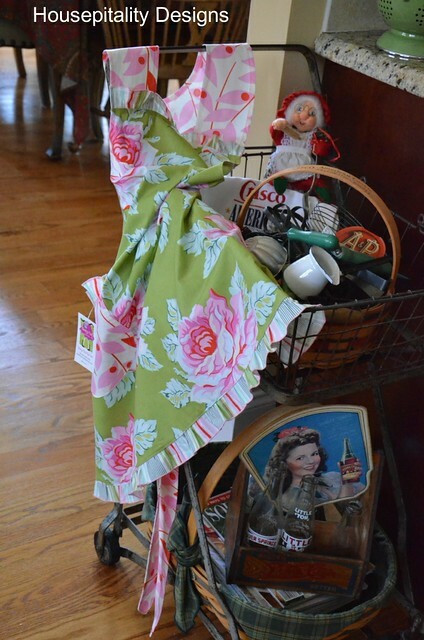 I placed it on my A&P vintage grocery cart to show you! 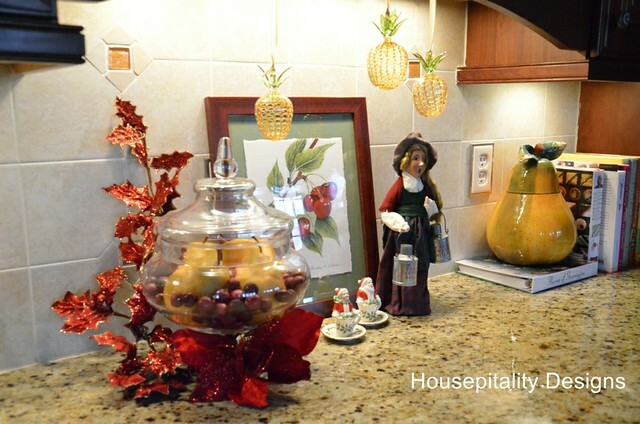 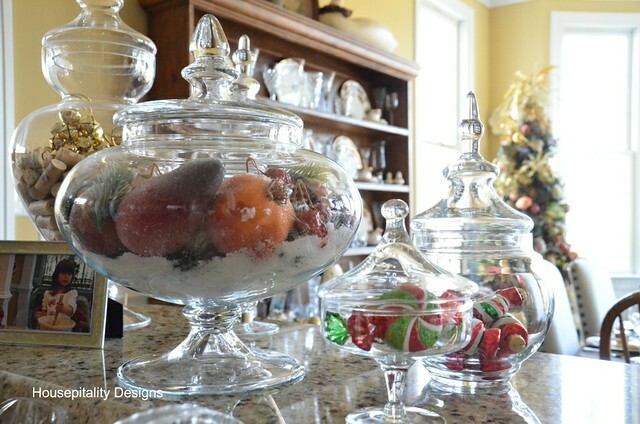 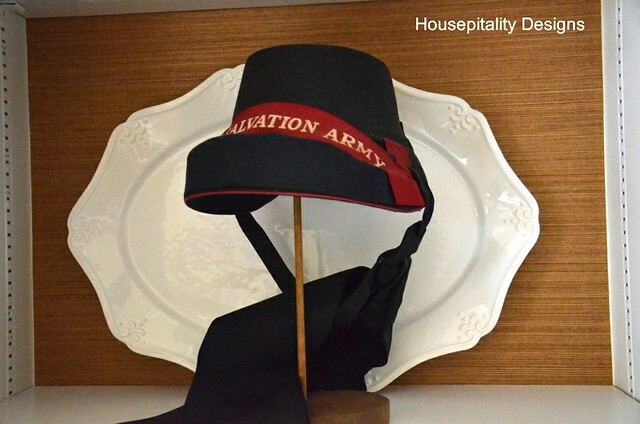 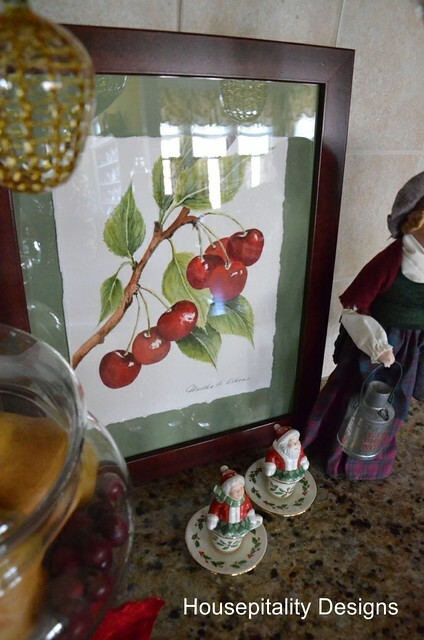 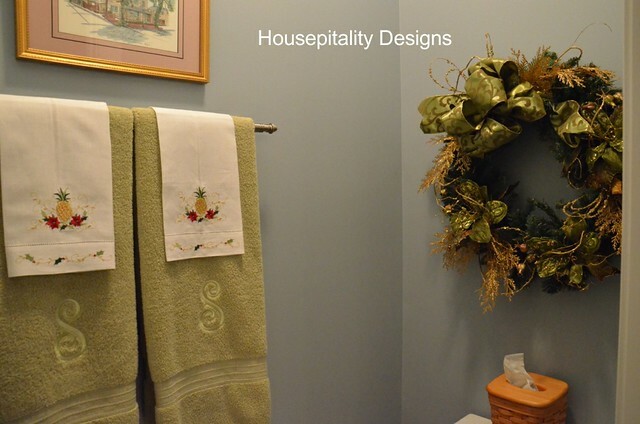 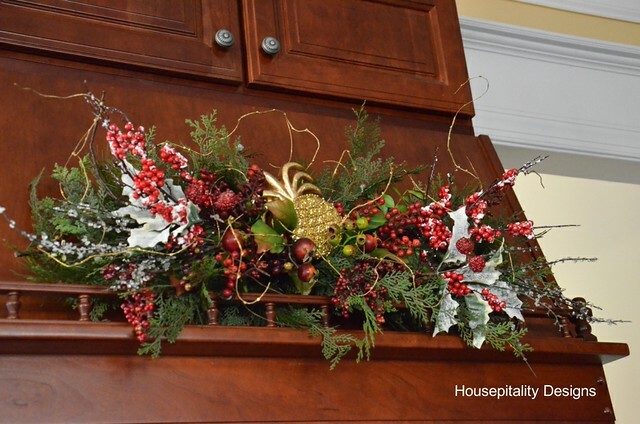 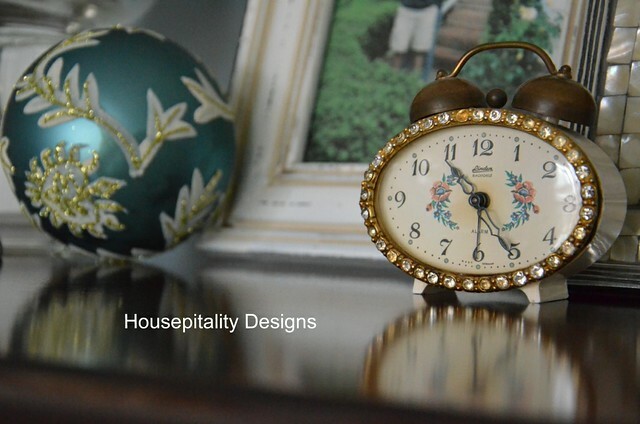 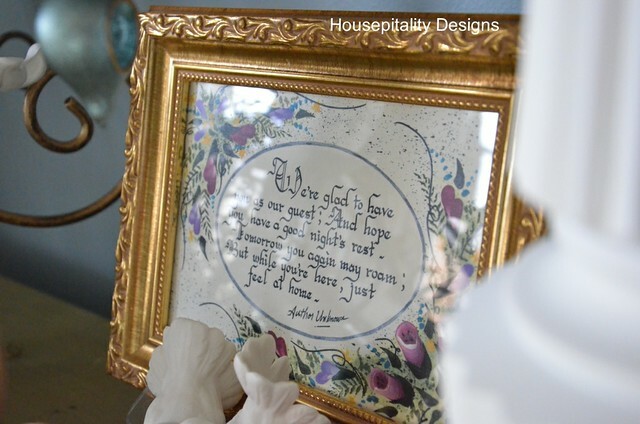 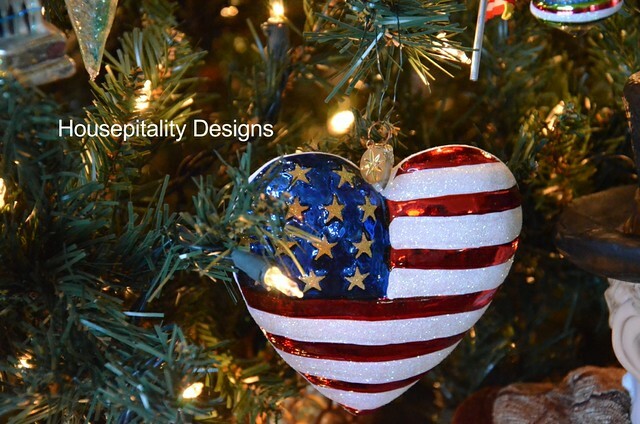 So there is most of my kitchen decor…the take out chefs were featured in this post….